Nach der erfolgreichen Premierensaison geht die ADAC TCR Germany mit Vollgas in die Saison 2017. Seit dem Start der Einschreibungen für die zweite Saison der Tourenwagenserie des ADAC Ende November wurden bereits 32 Fahrzeuge gemeldet. Insgesamt 13 Teams aus Deutschland und dem europäischen Ausland haben bereits frühzeitig die Chance genutzt, ihre Nennung abzugeben. Neben bekannten Mannschaften aus der Debütsaison, haben bereits auch vier neue Teams genannt. Die ADAC TCR Germany startet vom 28. bis 30. April in der Motorsport Arena Oschersleben in die Saison 2017. Die Rennen der ADAC TCR Germany sind auch im kommenden Jahr beim frei empfangbaren TV-Sender SPORT1 zu sehen. Die Markenvielfalt unter den rund 330 PS starken Renntourenwagen in der ADAC TCR Germany nimmt im kommenden Jahr dabei nochmals zu. Neben den aus diesem Jahr bekannten Marken und Fahrzeugen planen mindestens fünf Teams den Einsatz des neuen Audi RS3 LMS, der im Oktober beim Finalwochenende in Hockenheim vorgestellt wurde. Der ADAC rechnet mit weiterer Markenvielfalt. Eine Änderung gibt es im Rennkalender für die Saison 2017. Die Veranstaltung in Zandvoort in den Niederlanden findet eine Woche später statt und wird vom 21. bis 23. Juli ausgetragen. 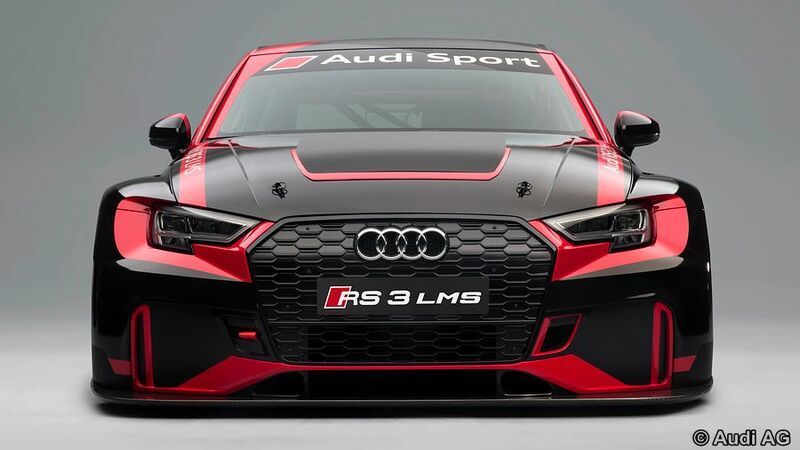 Die Audi Sport GmbH hat am Donnerstag in Neuburg die ersten zwei Audi RS 3 LMS ausgeliefert. Stephan Winkelmann, Geschäftsführer der Audi Sport GmbH, und Chris Reinke, Leiter von Audi Sport customer racing, übergaben die neuen TCR-Tourenwagen an Cadspeed-Racing (links) und das Speed Factory Racing Team (rechts), deren Saison bereits Mitte Januar 2017 beim 24-Stunden-Rennen in Dubai beginnt. "Nach der erfolgreichen Entwicklung und Erprobung war Ende November Produktionsstart des RS 3 LMS", sagt Chris Reinke. "Die Auslieferung der ersten Autos an Kundenteams ist ein besonderer Moment für dieses noch junge Projekt. Wir freuen uns über die große Nachfrage und sind schon sehr gespannt auf die ersten Rennen des RS 3 LMS in Kundenhand." 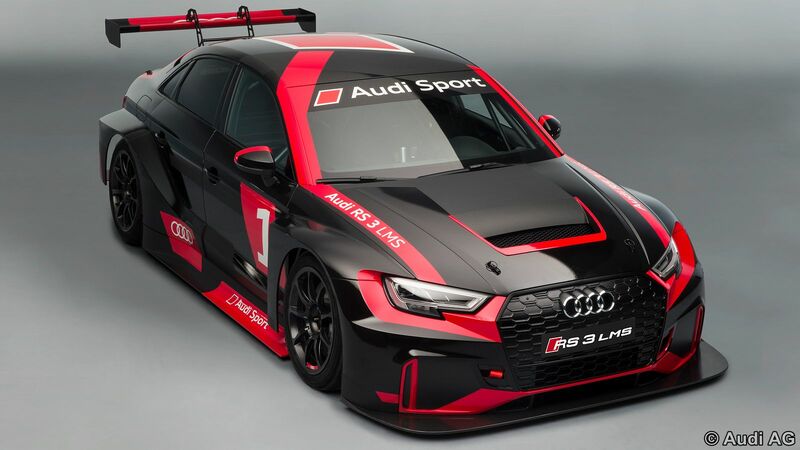 Der Audi RS 3 LMS wurde von der Audi Sport GmbH für die TCR-Tourenwagen-Kategorie entwickelt, für die es weltweit immer mehr Einsatzgebiete gibt. Dazu zählt inzwischen ebenfalls die neue TCR Middle East, die im Rahmen des 24-Stunden-Rennens in Dubai vom 12. bis 14. Januar 2017 ihre Premiere feiert. Auch für das 24-Stunden-Rennen auf dem Nürburgring und die VLN-Langstreckenmeisterschaft wurden gerade eigene Klassen für TCR-Tourenwagen etabliert. 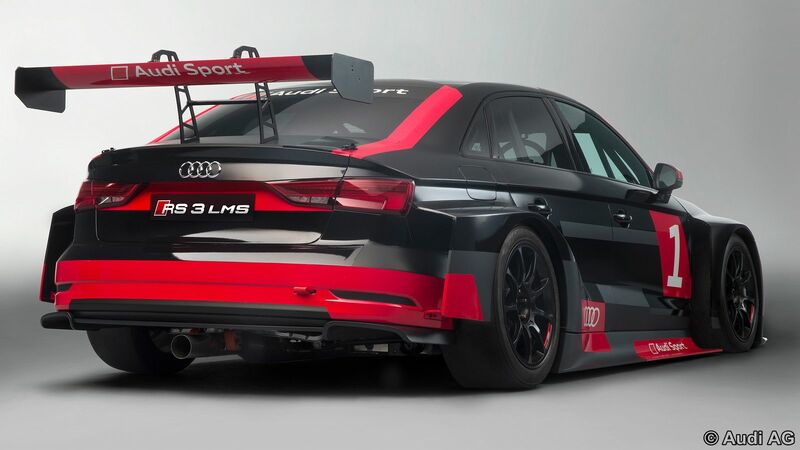 Der Audi RS 3 LMS stellt den Kundensport bei Audi auf eine noch breitere Basis. Zusammen mit dem GT3-Sportwagen Audi R8 LMS, der in seinem Segment Marktführer ist, bietet die Audi Sport GmbH erstmals zwei Kundensport-Rennwagen parallel an. 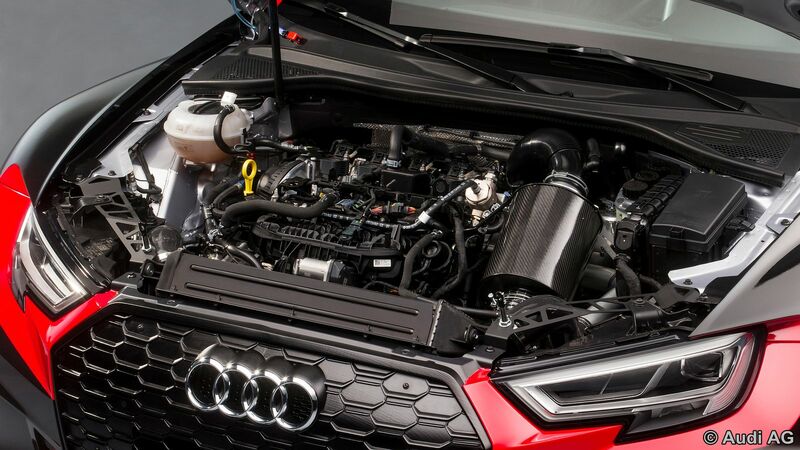 Ein 243 kW (330 PS) starker Vierzylinder-Zweiliter-TFSI-Motor beschleunigt den Audi RS 3 LMS in rund 4,5 Sekunden von 0 auf 100 km/h. Wie schon am 28. 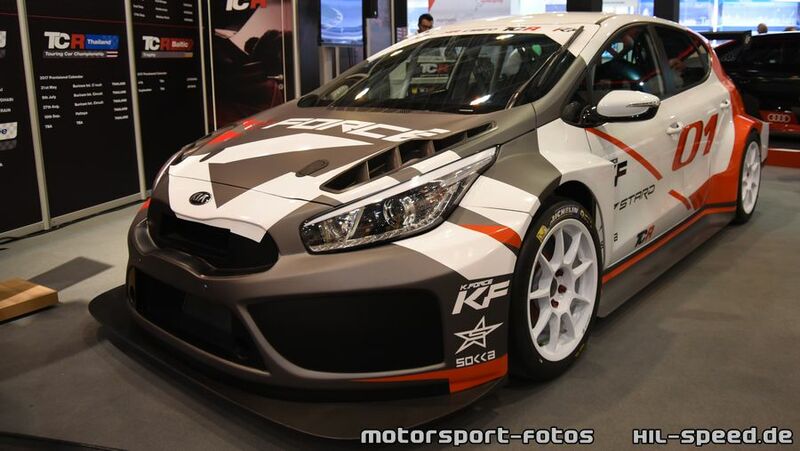 April auf dieser Seite berichtet wurde, präsentierte jetzt die Firma STARD (Stohl Advanced Research and Development) den KIA Cee'd zum Einsatz bei der TCR Serie auf der Messe 'Essen Motor Show'. Das Fahrzeug wurde auf der Basis des 5-Türer Cee'd entsprechend der TCR Spezifikation entwickelt. Der Motor soll 330 bhp (entspricht ungefähr 330 PS / 243 kW) leisten und über ein sequentiell zu schaltendes Getriebe mit 'Paddleshift' gesteuert werden. STARD hat bestätigt, daß die TCR-Version in limitierter Stückzahl für Kunden entwickelt und gefertigt wird. Die TCR International Series veröffentlicht die vorläufigen Termine der internationalen Saison 2017. Die Saison startet in Rustawi, einer Stadt in Georgien. Dann geht es über Bahrain (F1-Wochenende) zum bekannten GP-Kurs nach Spa-Francorchamps -im Rahmen des WEC-WM-Laufs. Ende Mai ist Monaco angesagt - dort auch im Rahmen des F1-Wochenendes. Weiter geht's zum Salzburgring und über den Hungaroring dann nach der Motorsportarena Oschersleben. Von Euroa geht es weiter nach Osten zum Chang International Circuit, Buriram in Thailand, nach Korea oder China und zurück zum Endlauf nach Abu Dhabi (F1-Wochenende). Die Premierensaison der ADAC TCR Germany ist gerade erst beendet, doch schon nimmt das zweite Jahr der neuen Tourenwagenserie des ADAC Konturen an. An sieben Wochenenden stehen im kommenden Jahr 14 Rennen in Deutschland, Österreich und den Niederlanden auf dem Programm. Auch 2017 werden die Rennen der ADAC TCR Germany im Free-TV bei SPORT1 zu sehen sein. Teams mit Interesse an der ADAC TCR Germany können sich ab dem 28. November für die Saison 2017 einschreiben. Auch im zweiten Jahr fährt die ADAC TCR Germany an gemeinsamen Rennwochenenden mit dem ADAC GT Masters sowie der ADAC Formel 4. Stefano Comini confirmed himself as the »king« of the TCR International Series by winning a second consecutive Drivers' title in what was, arguably, the most chaotic race meeting in the short history of the category. Despite the fact that both races were dramatically shortened by red flags and suspensions, the Swiss driver was able to exploit the remaining track time to show his driving skill and strategic view. A perfect start meant Comini put himself in the best position to win Race 1 and reduce his gap from James Nash (who retired after a collision with another car) to a mere half point. There was recognition too for the great efforts put in by Leopard Racing and Volkswagen Motorsport on their first season in TCR. The icing on the cake for them was Vernay's third position in the Drivers' standings. Craft-Bamboo Lukoil teammates James Nash and Pepe Oriola had to bow to the Comini-Vernay duo and placed themselves second and fourth in the championship. Both would have deserved to be champion, but were victims of the Guia street circuit 'law' that always favours those who are good (or lucky) enough to keep out of trouble. TCR promoter Marcello Lotti commented: "It was a shame that such an exciting season has come to an end with two races that were plagued by incidents and suspensions. We knew that this is always a risk you take when you decide to race in Macau but I'm afraid that this year, troubles have been increased by the decision to allow cars complying with different regulations to race together." This is also the reason why Macau has not been included in the provisional calendar of the 2017 TCR International Series. The first race turned into a complete chaos. A number of incidents prompted the red flag once and forced the safety car to intervene twice. Eventually only five laps were completed, equating to 50% of the scheduled race distance. As a consequence only 50% of the points were awarded. With Stefano Comini emerging as the winner and James Nash eliminated after he hit the wall, the gap between the two was reduced to only half-a-point before the final race, with the Briton still in the lead. The only other driver still in contention - at least theoretically - was Jean-Karl Vernay, 25 points behind the leader. Another chaotic race sacred Tiago Monteiro as the winner and Stefano Comini as the 2016 TCR International Series champion. This was the second consecutive title for the Swiss driver and the first one for Leopard Racing and the Volkswagen Golf GTi TCR car. Once again a pile up caused by the drivers from the Chinese championship forced the clerk of the course to suspend the race that resumed with only two laps to go. Once again half points were awarded. Guest star Monteiro who had pipped Comini and Jean-Karl Vernay at the start, emerged as the winner ahead of Vernay, Pepe Oriola and Comini who clinched the Drivers' title with only 3.5 points from Nash. 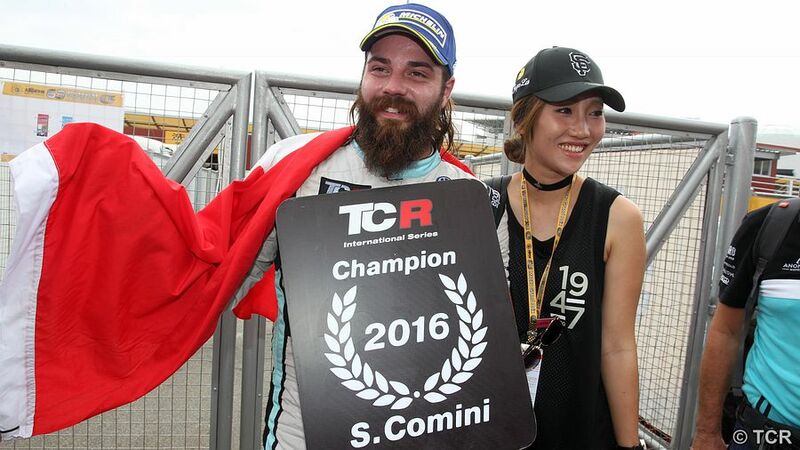 Just as in 2015, when Comini was crowned the category's first ever champion, the final races are set to provide some thrilling battles. Track activity will start on Thursday morning with a 30-minute Free Practice; a second Practice session will follow on Friday, while the Qualifying session split into Q1 (25 minutes) and Q2 (15 minutes, for the twelve fastest in Q1) will be run on Saturday in the early morning. The two back-to-back races will take place on Sunday morning; the finishing order of Race 1 will determine the grid for Race 2. Current championship leader James Nash will be the only driver to carry the Success Ballast on board his car during the TCR International Series final race meeting. The Briton's SEAT León will be laden by 30 extra kilos, as Nash emerged as the best scorer in the previous race meeting. At Sepang, Nash collected 33 points, more than the two race winners of the Malaysian event: Roberto Colciago (30) and Kevin Gleason (29). However, none of them will take part in the season's finale. Nash's SEAT will weigh 1345 kg, against the 1315 kg of the Honda Civic and other SEAT cars, while the Volkswagen Golf cars will run on 1285 kg. The season-ending weekend won't just be all about Nash, Comini, Oriola and Vernay; the finale always attracts guest drivers and this year is no exception, with two newcomers who are more than capable of springing surprises. 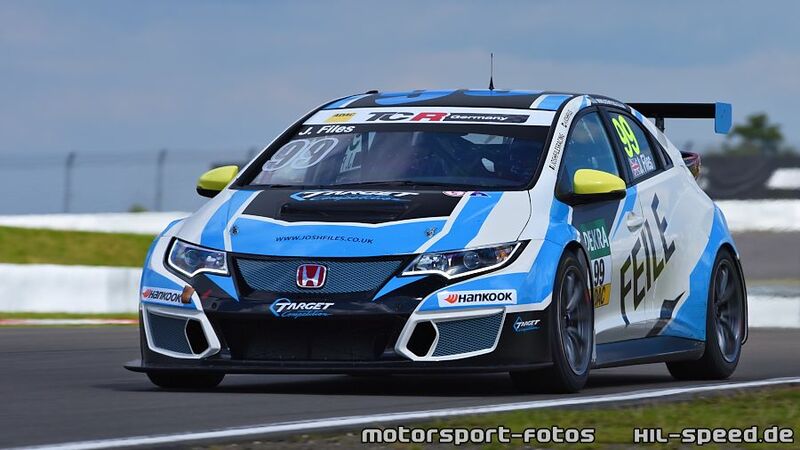 Portugal's Tiago Monteiro will be in the third WestCoast Racing Honda Civic, while British driver Josh Files competes in the same Target Competition Honda with which he won this year's TCR Germany title. Earlier this season, Monteiro had made a couple of appearances at the wheel of the Civic TCR at Spa and Zandvoort. After fielding only one car in the three previous race meetings at Buriram, Singapore and Sepang, Mulsanne Racing will run two Alfa Romeo Giulietta cars once again in the season finale. Petr Fulín will be back at the wheel after skipping Sepang for a previous commitment; the Czech driver will be joined by Andrea Belicchi in the team's second Giulietta. As Michela Cerruti is still undergoing medical checks since she suffered from the consequences of renal colic, Mulsanne Racing has called Belicchi to replace her. 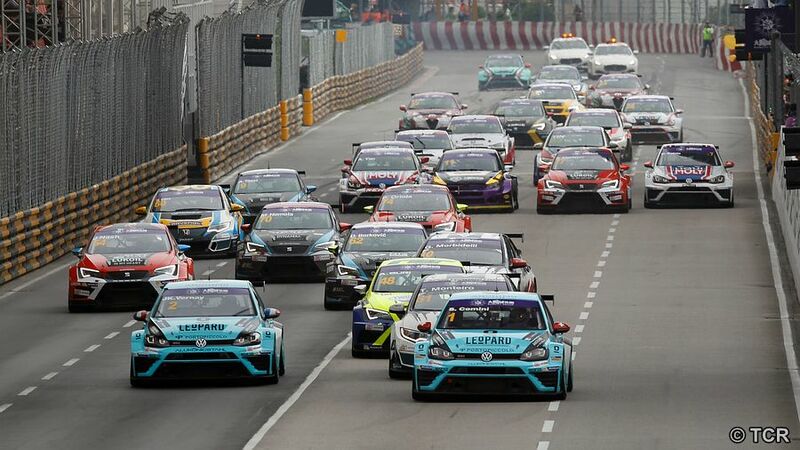 The Italian driver was a regular competitor in last year's TCR International Series, claiming one race victory and finishing sixth in the Drivers' Championship; he also obtained a brilliant second place in Macau's Race 2. During the current season, Belicchi made two occasional appearances with TCR cars: driving an Opel Astra in the International Series opening at Bahrain and a Honda Civic in the ADAC TCR Germany at the Red Bull Ring where he finished second in Race 2. 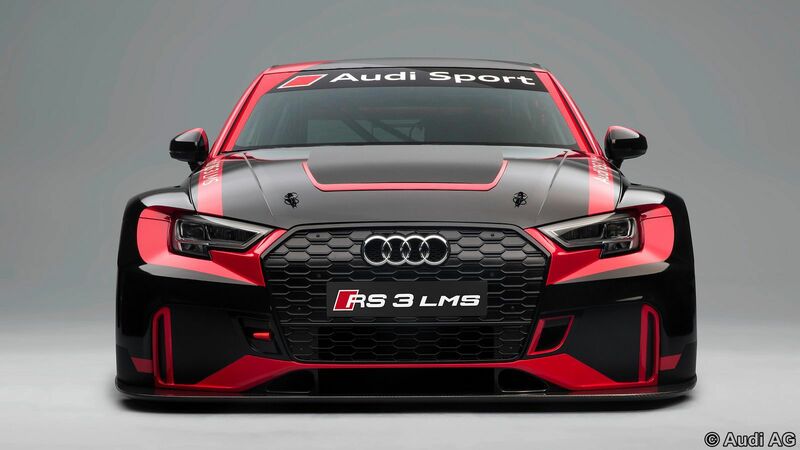 Mit einer Rennversion des neuen Audi RS 3, der auf dem Automobilsalon in Paris Weltpremiere hatte, erweitert Audi Sport customer racing ab der Saison 2017 sein Angebot im Kundensport. 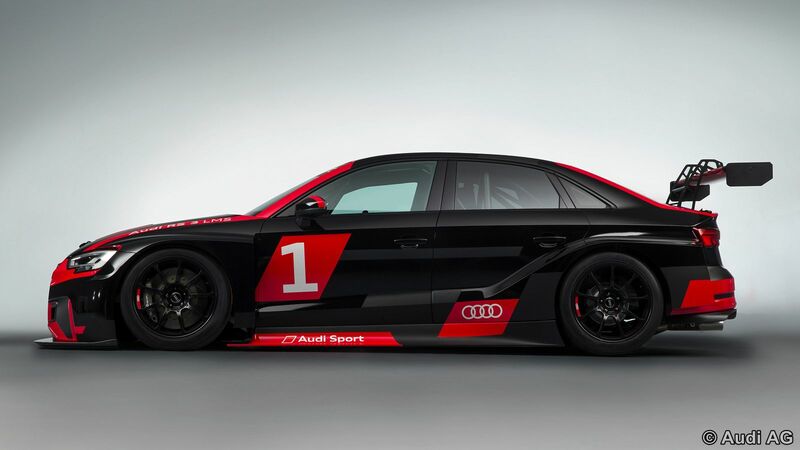 Die TCR-Version der Audi RS 3 Limousine stellt den Kundensport bei Audi auf eine noch breitere Basis. 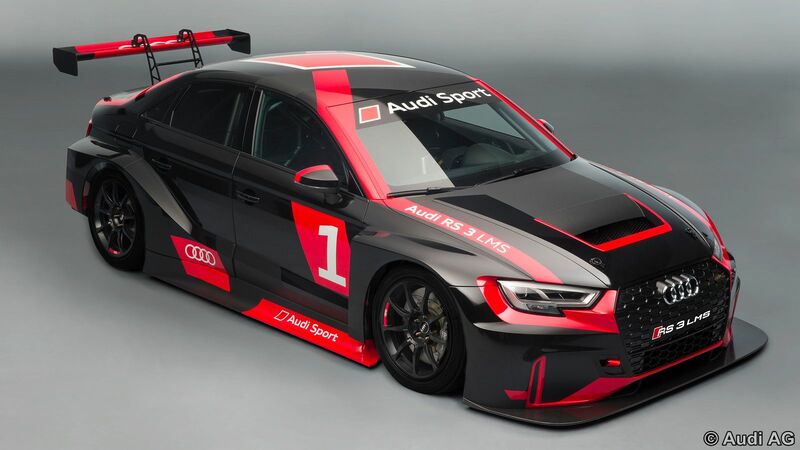 Der Audi RS 3 LMS wird von Audi Sport customer racing für die noch relativ junge TCR-Kategorie entwickelt. Neben einer internationalen TCR-Serie, deren Rennen teilweise im Rahmen der FIA-Formel-1-Weltmeisterschaft stattfinden, werden immer mehr nationale Rennserien für TCR-Tourenwagen gegründet. Auch große Langstrecken-Rennen wie die 24 Stunden Nürburgring schreiben inzwischen TCR-Klassen aus. "Der TCR-Markt hat noch mehr Potenzial als jener in der GT3-Kategorie", sagt Chris Reinke, Leiter Audi Sport customer racing. "2016 gab es bereits zehn TCR-Serien mit Rennen in 18 Ländern, und es kommen immer mehr Serien dazu. Mit der TCR-Version des RS 3 erreichen wir auch Länder, in denen es keine GT3-Rennen gibt. Die Kosten für einen TCR-Rennwagen sind sehr niedrig. 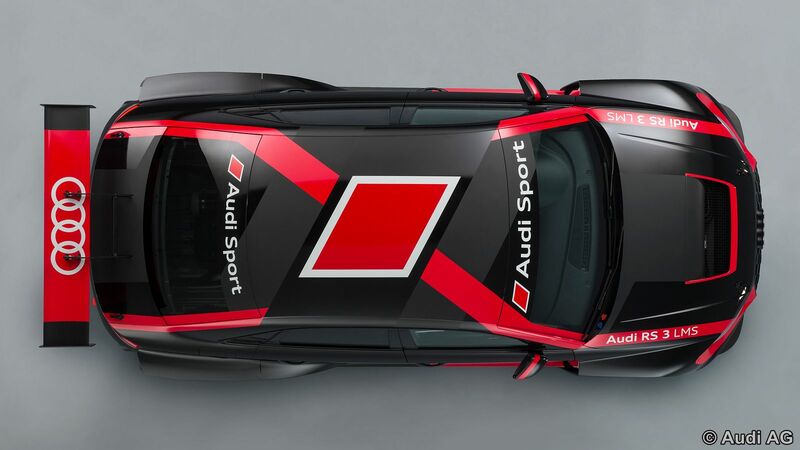 Dadurch werden wir auch neue Kunden für Audi Sport gewinnen. In puncto Support und Teileversorgung profitieren sie dabei von den Erfahrungen, die wir seit 2009 mit dem Audi R8 LMS gemacht haben und die unsere GT3-Kunden zu schätzen wissen." Der Audi RS 3 LMS beschleunigt in rund 4,5 Sekunden von 0 auf 100 km/h und erreicht eine Höchstgeschwindigkeit von etwa 240 km/h. Der bewährte Vierzylinder-Zweiliter-TFSI-Motor leistet im TCR-Trimm 243 kW (330 PS). In Sachen Sicherheit geht Audi Sport customer racing keine Kompromisse ein. Zum umfangreichen Sicherheitspaket zählen ein Sicherheitstank nach FIA-Reglement, eine Rennsport-Sicherheitszelle, der PS3-Sicherheitssitz, FIA-Sicherheitsnetze auf beiden Seiten des Sitzes und eine Rettungsluke im Dach analog zum Audi R8 LMS. 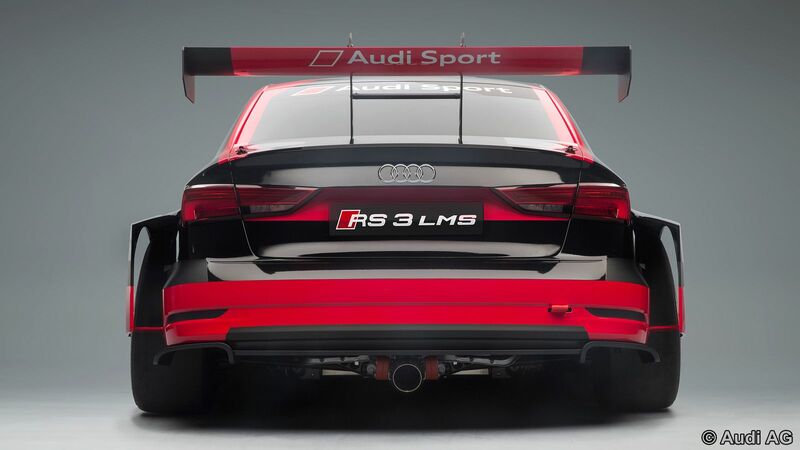 Die Auslieferung der ersten Audi RS 3 LMS für Kunden beginnt Audi Sport customer racing im Dezember dieses Jahres und damit rechtzeitig vor dem Saisonstart der wichtigsten TCR-Rennserien 2017. Der Kaufpreis liegt bei 129.000 Euro (zzgl. MwSt.) für die TCR-Variante mit sequenziellem Sechsgang-Renngetriebe und 99.000 Euro (zzgl. MwSt.) für eine Clubsportversion. "Eine große Liebe für den Motorsport"
Die beiden gibt es nur im Doppelpack: Wenn Mike und Michelle Halder über ihre große Leidenschaft Motorsport sprechen, geraten die Geschwister aus Meßkirch ins Schwärmen. "Wir haben beide eine große Liebe für den Sport im Allgemeinen und den Motorsport speziell. Wir sind beide sehr ehrgeizig und zielstrebig. Wir machen fast alles gemeinsam", sagt die 17 Jahre alte Michelle (Liqui Moly Team Engstler), die in der ADAC Formel 4 fährt: "Wir kommen sehr gut miteinander zurecht. Wir verbringen fast jedes Wochenende zusammen und verstehen uns super. Deswegen passt das einfach alles." Auch für ihren Bruder Mike (20, Liqui Moly Team Engstler), der in der neuen Tourenwagenserie ADAC TCR Germany startet, dreht sich alles um Motorsport. Tagsüber arbeitet der gelernte KFZ-Mechatroniker im Betrieb der Eltern in der Werkstatt oder im Vertrieb, doch in jeder freien Minute kümmert sich der 20-Jährige um seinen Seat Leon TCR [# 7] und den Formel-Rennwagen seiner kleinen Schwester. "Der Motorsport hält die Familie schon sehr zusammen. Wenn einer nicht dabei wäre, würde etwas fehlen. Uns gehören die beiden Autos, wir nehmen sie auch nach den Rennen immer mit nach Hause. Ich warte beide Autos komplett selbst, stelle sie ein, repariere die beschädigten Stellen und foliere selbst. Das ist nicht wie bei anderen Fahrern und Rennställen, bei denen sich ein Team um das Auto kümmert", sagt Mike: "Michelle hilft mir, so gut es geht. Sobald sie abends von ihrer Ausbildung als Mediengestalterin nach Hause kommt, gehen wir entweder zusammen zum Fitnesstraining oder richten die Autos her und bereiten die Rennwochenenden vor." Und die enge Zusammenarbeit der Halders setzt sich dann auch an den Rennstrecken fort. Die Eltern, die früher selbst hobbymäßig Kart gefahren sind, sind immer als moralische und kompetente Unterstützer dabei. In den Pausen kümmert sich Mike in Zusammenarbeit mit einem Freund um die Einstellung der beiden Wagen - ganz nach dem Motto: "Rennanzug aus, Schaffklamotten an - und ran ans Auto", sagt Mike lächelnd. Auf diesen Zusammenhalt ist die von der ADAC Stiftung Sport geförderte Michelle besonders stolz. "Das ist eigentlich wie ein Familienbetrieb. Es ist schön, dass wir das alle zusammenmachen können", sagt sie. Auch wenn Formel- und Tourenwagensport gänzlich unterschiedlich sind, stehen die Geschwister im ständigen Austausch. "Formelsport kam für mich eigentlich nie in Frage. Mich begeistern halt vor allem die Zweikämpfe, die 'Berührungen' auf fairer Basis. Das ist ein ganz anderes Rennfahren im Tourenwagensport als im Formelsport", sagt Mike, und Michelle ergänzt: "Er ist ein sehr guter Fahrer, und ich bin froh, dass ich seine Schwester bin. Ich bin quasi auf der Kartbahn groß geworden, habe ihm - schon auf dem Arm der Mutter - immer zugeschaut. Bereits im Kartsport konnte ich mir immer Tipps von ihm holen, und da lerne ich immer von ihm dazu." Selbst am Frühstückstisch dreht sich bei den Halders alles um Motorsport - und langfristig träumen beide Geschwister davon, ihre Leidenschaft zum Beruf zu machen. "Für mich steht die Aus- und Weiterbildung an erster Stelle. Aber natürlich ist es das Ziel, im Motorsport Geld zu verdienen", sagt Mike. Sportlich läuft es für die Halders gut, jüngst fuhr Mike in Zandvoort mit den Rängen sechs und drei die nächsten Meisterschaftspunkte ein. Vor dem abschließenden Rennwochenende der Saison Anfang Oktober auf dem Hockenheimring will vor allem Mike gerne an die letzten Erfolge anknüpfen. "Mit den Wochenenden am Nürburgring und jetzt in Zandvoort war ich super zufrieden. Es war ein ganz enges Feld wie immer in der ADAC TCR Germany", sagt der 20-Jährige, in dieser Saison bereits zweimal Zweiter wurde und vor dem Finale auf Rang fünf der Gesamtwertung liegt. 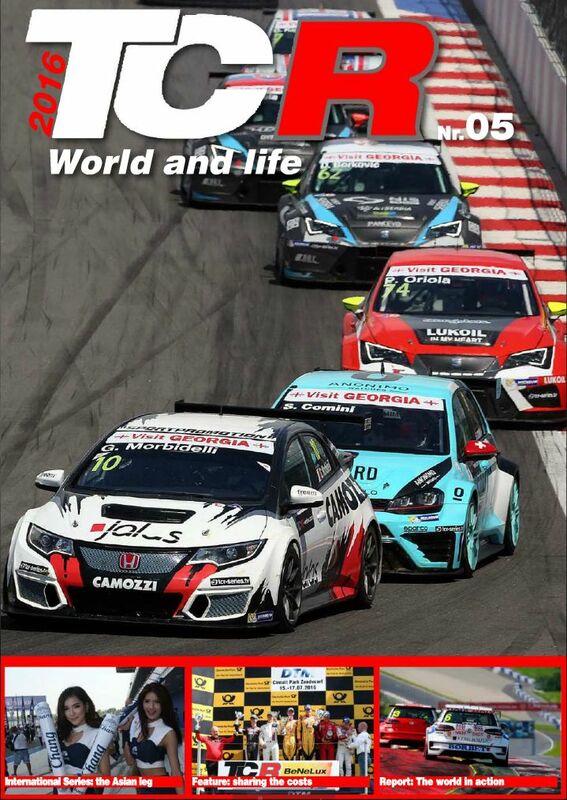 TCR World & life - Issue #5 is online ! Harald Proczyk (40, Österreich, HP Racing [# 22]) hat das von Wind und Regen geprägte zweite Rennen der ADAC TCR Germany im niederländischen Zandvoort gewonnen und die Entscheidung im Titelrennen bis zum Finalwochenende in Hockenheim (30. September bis 2. Oktober) vertagt. Der Seat-Pilot übernahm nach dem Start die Führung und behielt bei widrigen Bedingungen die Ruhe. Das Rennen wurde nach mehreren Ausrutschern in die Kiesbetten bei starken Regen vorzeitig nach sieben Runden mit der roten Flagge abgebrochen und nicht wieder neu gestartet. "Wir hatten ein super Auto, es hat viel zusammengepasst", sagte Proczyk: "Man darf aber auch die freie Sicht nicht unterschätzen." Neben Proczyk fuhren Samstagssieger Antti Buri (27, Finnland, LMS Racing) und Mike Halder (20, Meßkirch, Liqui Moly Team Engstler) im Seat León TCR aufs Podium. "Ich war noch nie in Zandvoort. Direkt am ersten Wochenende aufs Podium zu fahren, ist sehr gut", sagte Halder nach der Siegerehrung. Grund zum Jubeln hatte auch Tom Lautenschlager (17, Grafenau, Liqui Moly Team Engstler): Der ADAC Stiftung Sport-Förderpilot wurde Neunter und sicherte sich damit vorzeitig den Titel in der Juniorenwertung. "Wir haben unser Ziel erreicht, es freut mich natürlich sehr und macht mich stolz", sagte Lautenschlager: "Ich hätte mir aber ein etwas längeres Rennen gewünscht, damit ich zeigen kann, was ich kann. Mit jeder Runde habe ich mich hier auf der Bahn besser eingefunden. Jetzt freue ich mich auf Hockenheim und will dann noch ein gutes Ergebnis holen." Vierter wurde im VW Golf GTI TCR Tim Zimmermann (19, Langenargen, Liqui Moly Team Engstler) vor Meisterschaftsanwärter Josh Files (25, Großbritannien, Target Competition), der bester Fahrer im Honda Civic TCR war. Es folgten die beiden VW Golf-Piloten Niklas Mackschin (21, Barsinghausen, Liqui Moly Team Engstler) und Benjamin Leuchter (28, Duisburg, Racing One). Wie im ersten Rennen am Samstag wurde Niko Kankkunen (17, Finnland, LMS Racing) bester Junior. Der Sohn des viermaligen Rallye-Weltmeisters Juha Kankkunen wurde im Seat vor Lautenschlager Achter. Die Top Ten komplettierte Kai Jordan (47, Wolfsburg, JBR Motorsport) im VW Golf. Lautenschlager hat damit bereits am vorletzten Rennwochenende der ADAC TCR Germany die Juniorenwertung für sich entschieden. Vor dem Saisonfinale am Hockenheimring am ersten Oktoberwochenende hat der VW Golf-Pilot 67,5 Punkte Vorsprung auf Dominik Fugel (19, Chemnitz, Team Honda ADAC), der Zandvoort ohne Punkte verlässt. Aufgrund des Dauerregens war die Strecke an der Nordseeküste komplett nass, was im Rennverlauf zu Ausrutschern ins Kiesbett von mehreren Teilnehmern führte und in der Folge zwei Safety Car-Phasen auslöste. Davon ließ sich Proczyk jedoch nicht aus der Ruhe bringen. Nach einem weiteren Ausrutscher in den Kies von Honda-Pilot Finlay Crocker (46, Großbritannien, VFR Racing) wurde das Rennen nach sieben Runden mit der roten Flagge vorzeitig abgebrochen. Mit seinem Sieg in Zandvoort wahrt sich Proczyk noch eine Minimalchance auf den Gewinn der Meisterschaft. Nach zwölf von 14 Saisonrennen fehlen dem Österreicher 41,5 Punkte auf den Gesamtführenden Files, in Hockenheim werden insgesamt noch 55 Punkte vergeben. "Da müssen wir in Hockenheim viel Glück haben, damit es noch klappt", sagte Proczyk: "Aber es ist natürlich schön, dass die Meisterschaft noch nicht entschieden ist." Antti Buri (27, Finnland, LMS Racing) [# 10] hat das erste Rennen der ADAC TCR Germany im niederländischen Zandvoort gewonnen. Der Seat-Pilot, der auf Platz fünf gestartet war, setzte sich in einem spannenden Rennen erst in der letzten Runde an die Spitze des Feldes. "Wir waren zuversichtlich vor dem Rennen, aber dass es so gut klappt, hätten wir vielleicht gar nicht gedacht", sagte Buri nach seinem Sieg. Zweiter wurde Pole-Setter Josh Files (25, Großbritannien, Target Competition) im Honda Civic TCR. Drei Zehntelsekunden hinter dem Führenden der Gesamtwertung kam Harald Proczyk (40, Österreich, HP Racing) im Seat León TCR ins Ziel. Vor dem zweiten Rennen am Sonntag (09.30 Uhr, live bei SPORT1+ und im Livestream unter www.adac.de/tcr-germany und www.sport1.de) hat Files 56,5 Punkte Vorsprung vor Proczyk. Die Entscheidung im Kampf um den Titel der Premierensaison der ADAC TCR Germany fällt somit am letzten Rennwochenende in Hockenheim. Auch wenn Files die frühzeitige Entscheidung verpasst hat, war er dennoch mit dem ersten Rennen in Zandvoort zufrieden: "Der zweite Platz ist auch gut - besonders, weil ich vor Hari gelandet bin. Der Vorsprung in der Gesamtwertung ist groß, aber im Motorsport kann alles passieren." Unmittelbar hinter dem Spitzen-Trio überquerten Tim Zimmermann (19, Langenargen, Liqui Moly Team Engstler) im VW Golf GTI TCR, Steve Kirsch (37, Chemnitz, Team Honda ADAC) und Seat-Pilot Mike Halder (20, Meßkirch, Liqui Moly Team Engstler) die Ziellinie. Proczyk und Halder trennten nur eine Sekunde. Gastfahrer Finlay Crocker (46, Großbritannien, VFR Racing) wurde im Seat Siebter, Benjamin Leuchter (28, Duisburg, Racing One) schaffte es nach einer starken Aufholjagd auf Platz acht. Aufgrund eines Verstoßes gegen die technischen Regularien im Qualifying wurde der VW-Pilot in der Startaufstellung nach hinten versetzt. Die Top Ten komplettierten Ronny Jost (28, Schweiz, TOPCAR Sport) und Pascal Eberle (25, Schweiz, Steibel Motorsport). Bester Junior wurde Niko Kankkunen (17, Finnland, LMS Racing) als Elfter. Bis das erste Rennen auf dem anspruchsvollen Kurs an der Nordseeküste beginnen konnte, mussten die Fans sich allerdings gedulden. Nachdem Niklas Mackschin (21, Barsinghausen, Liqui Moly Team Engstler) beim Start stehengeblieben war, kollidierte Lokalmatador Bas Schouten (21, Niederlande, ST Motorsport) mit dessen VW Golf. Es folgte ein Rennabbruch, um den Seat von Schouten zu bergen, ehe das Rennen über eine Restdauer von zehn Minuten neu gestartet wurde. In den finalen Rennminuten entwickelt sich ein packender Kampf um die Spitze, der erst in der Finalrunde entschieden wurde, als Buri den bis dahin führenden Files überholte und sich Proczyk noch auf Rang drei nach vorn kämpfte. Aufgrund des zwischenzeitlichen Abbruches wurden weniger als 75% der geplanten Renndistanz absolviert, daher wurden für den elften Saisonlauf nur halbe Punkte vergeben. Im zweiten Lauf am Sonntag steht Simon Larsson (19, Schweden, Target Competition), der in Zandvoort sein Debüt in der ADAC TCR Germany gibt, auf der Pole Position. Neben dem Seat-Piloten steht Schouten in der ersten Reihe. Im zweiten Rennen starten die zehn schnellsten Fahrer des Qualifyings in umgekehrter Reihenfolge. Antti Buri geht demnach als Zehnter ins zwölfte Saisonrennen. Die Nationale TCR-Serie wurde ab den Läufen auf dem Nürburgring durch 3 neue Opel Astra TCR verstärkt. Am Steuer der Opel werden Jasmin Preisig (23, Schweiz, Lubner Motorsport), Pierre Yves Corthals (39, Belgien, DG Sport Competition) und Jordi Oriola Vila (20, Spanien, DG Sport Competition) sitzen. Der Finne Antti Buri (27, LMS Racing) hat beim zehnten Rennen der ADAC TCR Germany auf dem Nürburgring seinen zweiten Saisonsieg gefeiert. Im Seat Leon Cup Racer siegte Buri vor seinem Markenkollegen Mike Halder (20, Meßkirch, Liqui Moly Team Engstler) und Meisterschaftsanwärter Josh Files (25, Großbritannien, Target Competition) im Honda Civic TCR. "Das war ein tolles Rennen. Es hat alles gut geklappt, Mike und ich lagen anfangs eng beieinander. Aber dann habe ich mir eine Lücke herausgefahren, konnte pushen und das Tempo bestimmen. Natürlich bin ich sehr glücklich", sagte Buri. Files, Sieger des Rennens am Samstag, baute mit Rang drei seine Führung in der Gesamtwertung weiter aus. Er steht bei 168 Punkten und damit 50 Zähler vor Harald Proczyk (40, Österreich, HP Racing, 118 Punkte), der am Sonntag als 14. zum zweiten Mal an diesem Wochenende nicht in die Punkte fuhr. Kirsch hat als Dritter 108 Punkte. Josh Files (25, Großbritannien, Target Competition) hat das neunte Saisonrennen der ADAC TCR Germany auf dem Nürburgring gewonnen und seine Führung in der Gesamtwertung weiter ausgebaut. 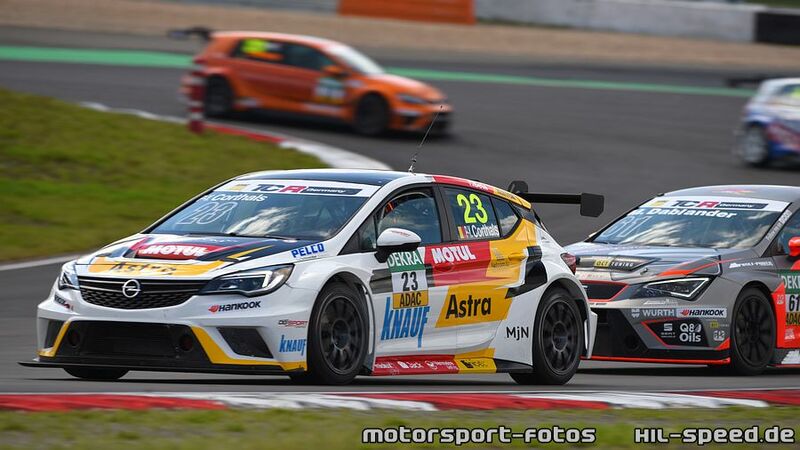 Nach einem erneut fehlerfreien Rennen landete Files in seinem Honda Civic TCR vor den beiden Gastfahrern Jordi Oriola Vila (20, Spanien, DG Sport Competition) und Pierre Yves Corthals (40, Belgien, DG Sport Competition), die dem neuen Opel Astra TCR eine gelungene Premiere in der ADAC TCR Germany bescherten. "Es war hart, weil Jordi im Opel echt sehr schnell war. Trotzdem konnte ich mir ein Polster herausfahren und auch nach dem Restart vorne bleiben. Jedes Rennen ist anders, heute musste ich alles geben. Ich bin superglücklich, dass das geklappt hat", sagte Files, der nach seinem fünften Saisonsieg 153 Punkte auf dem Konto hat. Mario Dablander (28, Österreich, Seat Austria) wurde Vierter vor seinem Seat-Markenkollegen Pascal Eberle (25, Schweiz, Steibel Motorsport) und Lokalmatador Benjamin Leuchter (28, Duisburg, Racing One) im VW Golf GTI TCR. Die beiden Seat-Piloten Bas Schouten (21, Niederlande, ST Motorsport) und Mike Halder (20, Meßkirch, Liqui Moly Team Engstler) belegten die Plätze sieben und acht. Als Neunter war der von der Stiftung Sport geförderte Tom Lautenschlager (17, Grafenau, Liqui Moly Team Engstler) in einem weiteren VW zugleich bester Junior. Pole-Setter Jürgen Schmarl (42, Österreich, Target Competition), der aufgrund eines Motorwechsels bei seinem Honda Civic TCR am Ende des Feldes starten musste, fuhr als Zehnter in die Punkte. Unbekümmert, mutig und verdammt schnell: Josh Files (25, Großbritannien, Target Competition) ist eine der prägenden Figuren in der Premieren-Saison der ADAC TCR Germany. Nach vier von sieben Rennwochenenden liegt der Brite an der Spitze der Gesamtwertung - und Josh Files will seine persönliche Erfolgsgeschichte am Wochenende auf dem Nürburgring fortschreiben. "Ich kenne den Nürburgring von einem historischen Rennen. Damals ging es aber über die Nordschleife und die Grand-Prix-Strecke. Wir wollen als Team weiter gewinnen, ich bin immer zuversichtlich, und wenn es dann auch noch persönlich für die Meisterschaft reicht, wäre das der ultimative Traum", sagt Files im Hinblick auf das kommende Wochenende und die nachfolgenden Veranstaltungen in Zandvoort und Hockenheim. Vier der bisherigen acht Saisonrennen hat der Mann aus Norwich gewonnen und dabei kaum Schwächen gezeigt. Zunächst war er im Seat Leon Cup Racer unterwegs, und auch der Wechsel ins Cockpit des Honda Civic TCR gelang dem 25-Jährigen scheinbar mühelos. Jüngst zu sehen auf dem Red Bull Ring, als er von Startplatz sieben in kürzester Zeit an die Spitze fuhr und das Rennen letztlich souverän gewann. Das Warten hat ein Ende: Wenn die ADAC TCR Germany am kommenden Wochenende (5. bis 7. August) auf dem Nürburgring in sein fünftes Rennwochen startet, dürfen sich die Fans der neuen Tourenwagenserie des ADAC auf den Opel Astra TCR freuen. Drei Opel sind für die Saisonrennen neun und zehn auf dem Traditionskurs in der Eifel gemeldet. 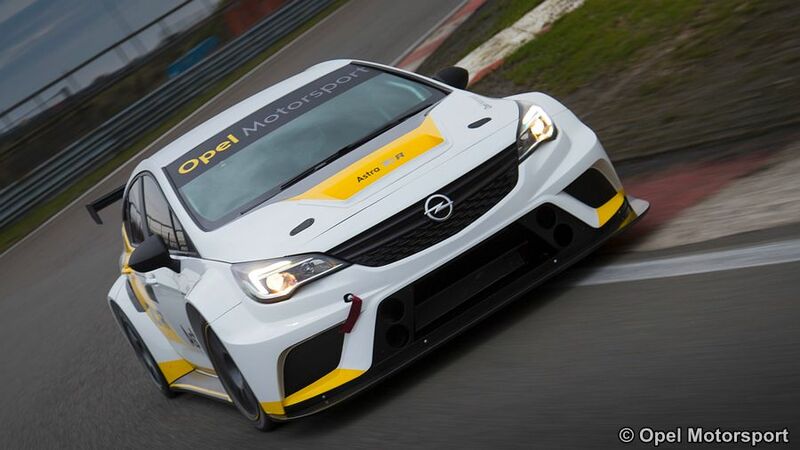 330 PS, Höchstgeschwindigkeiten bis 250 km/h und ein unverwechselbares, attraktives Design: Der Opel Astra TCR wird die ADAC TCR Germany um ein weiteres Highlight bereichern. Am Steuer der Opel werden Jasmin Preisig (23, Schweiz, Lubner Motorsport), Pierre Yves Corthals (39, Belgien, DG Sport Competition) und Jordi Oriola Vila (20, Spanien, DG Sport Competition) sitzen. Damit präsentiert die ADAC TCR Germany ab August alle vier Marken. 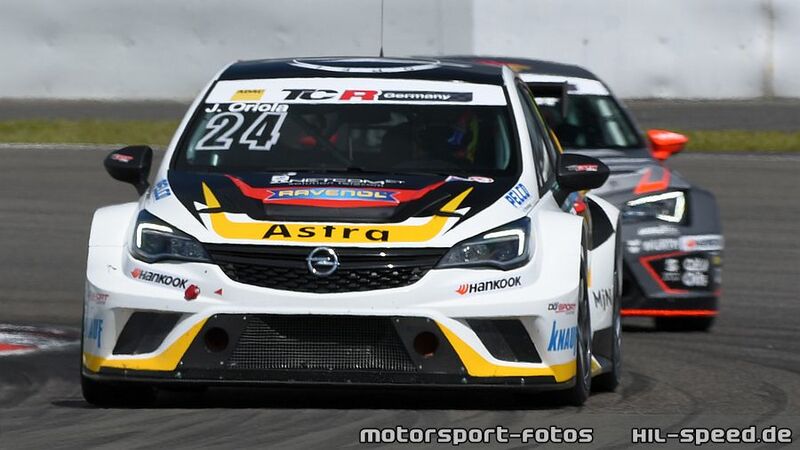 Neben dem Opel Astra TCR werden auch die bereits bekannten Honda Civic TCR, Seat Leon Cup Racer und VW Golf GTI TCR zu sehen sein. 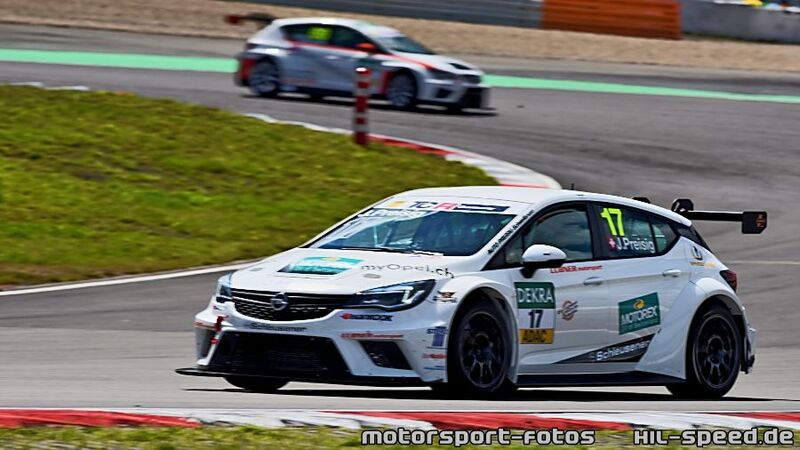 "Wir haben mit dem Opel Astra TCR bereits zwei erfolgreiche Testeinsätze in der TCR Benelux durchgeführt", sagte Christian Jupsin, der Vorsitzende des Rennstalls DG Sport Competition: "Wir wollen nun zeigen, dass der Astra TCR auch im harten Wettbewerb der ADAC TCR Germany gegen die starken Mitbewerber bestehen kann." Die ADAC TCR Germany begrüßt damit neben den beiden neuen Pilot Pierre Yves Corthals und Jordi Oriola Vila mit Jasmin Preisig auch ihre erste Fahrerin. Die 23-jährige Schweizerin fährt erfolgreich im Opel Astra OPC Cup, fieberte aber parallel immer mit dem Renngeschehen in der ADAC TCR Germany mit und freut sich nun auf ihre Premiere. Rutschpartie auf profillosen Slicks im Regen: Einsetzender Regen in der Startphase sorgte im zweiten Rennen der ADAC TCR Germany in der Motorsport Arena Oschersleben für eines der actionreichsten und spannendsten Rennen mit einem bis zur letzten Runde offenen Kampf um den Sieg. In einer spektakulären Finalrunde eroberte Josh Files (25, Großbritannien, Target Competition) im Honda Civic TCR die Spitze und siegte. Mit dem dritten Saisonsieg übernahm der Brite die Tabellenführung. "Ohne das wechselhafte Wetter wären wir niemals von Startplatz zehn zum Sieg gefahren", sagte Files. "Das Rennen war bestimmt spannend anzuschauen und es war vor allem großartig, mitzufahren." Noch spektakulärer war die Aufholjagd von Bas Schouten (21, Niederlande, ST Motorsport): Der Seat León-Pilot startete als Letzter und wurde am Ende Zweiter. "Es war ein schwieriges Rennen, vor allem, wenn man von ganz hinten kommt. Aber der Regen liegt mir", sagte Schouten nach der Siegerehrung. 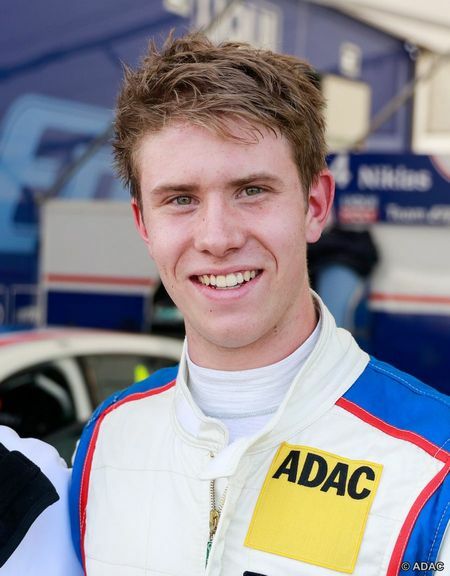 Als Dritter überquerte Tim Zimmermann (19, Langenargen, Liqui Moly Team Engstler) die Ziellinie. Lange sah es so aus, als würde der ehemalige Pilot der ADAC Formel 4 im Volkswagen Golf GTI TCR seinen ersten Sieg in der neuen Tourenwagenserie des ADAC feiern, in der letzten Runde wurde er jedoch von Files und Schouten überholt und war dementsprechend unzufrieden: "Ich habe im Ausgang der Schikane nicht damit gerechnet, dass Files auf der Innenseite ist. Aber auf einmal war er da, war innen und dann vorbei. Das war klar mein Fehler. Ich bin einfach enttäuscht." Auf die Plätze vier und fünf fuhren die beiden Seat-Piloten Mike Halder (20, Messkirch, Liqui Moly Team Engstler) und Harald Proczyk (40, Österreich, HP Racing), der nach den Rennen in der Magdeburger Börde im Klassement fünf Punkte hinter Files (95 Punkte) liegt. Bester Junior wurde Halders Teamkollege Tom Lautenschlager (17, Grafenau, Liqui Moly Team Engstler) im VW Golf GTI TCR auf Platz zehn. Bereits in der ersten Kurve überholte der auf zwei gestartete Seat-Pilot Antti Buri (27, Finnland, LMS Racing) den Sieger aus dem ersten Rennen, Dominik Fugel (19, Chemnitz, Team Honda ADAC) im Honda Civic TCR. Im weiteren Rennverlauf verlor Fugel immer mehr Positionen, ehe er eine Runde vor Schluss ausschied. Seine Führung in der Junior-Wertung behält Fugel dennoch. Nach halber Renndistanz gab es bei Buris Seat technische Probleme, sodass der Finne die Führung an Zimmermann verlor und letztlich Sechster wurde. Eine Safety Car-Phase nach einem Ausrutscher bei den schwierigen Streckenbedingungen 13 Minuten vor Rennende bremste das Feld ein. 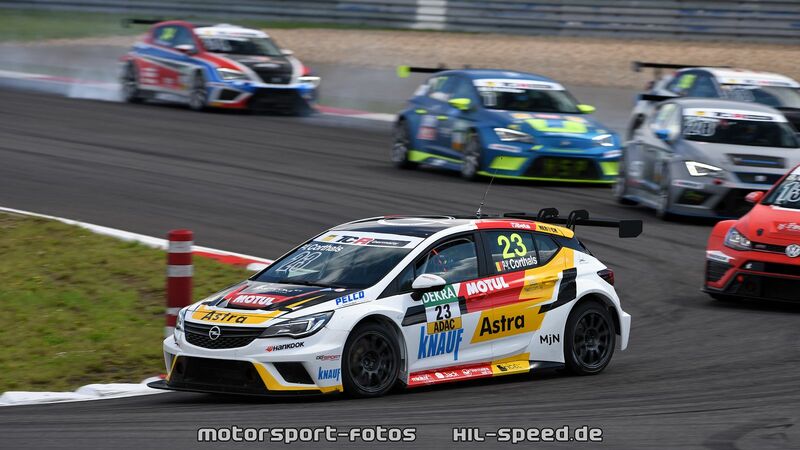 Nächster Halt der ADAC TCR Germany ist vom 22. bis zum 24. Juli der Red Bull Ring in Spielberg, Österreich. 28.8. - Buriram - Chang Int. The half-season mark was rounded at Oschersleben, where the TCR International Series offered two action-packed races, that the changing weather conditions were made even livelier. The main take-away of the weekend is that, after three winless events, the SEAT León cars took a double victory and monopolized the podium positions. It was an emotional Race 1 for Mat'o Homola, as the young Slovak took his maiden win in the series, while Race 2 allowed Pepe Oriola to go back to the highest spot of the podium that he hadn't visited since the season-opener in Bahrain. Both Dusan Borkovic and James Nash collected a double podium finish, which in the case of the Serbian means breaking a string of frustrating results. His and Homola's harvest of heavy points also meant that B3 Racing Hungary is now a brilliant second in the Teams' standings behind Craft-Bamboo Lukoil. Oriola has also regained the lead in the Drivers' Championship, although being on equal points with his teammate Nash, who proved again his consistency by taking two third places. Homola is now only four points behind the duo, while Stefano Comini, Gianni Morbidelli and Jean-Karl Vernay have had a more difficult weekend as they were involved in different race incidents. They all struggled to salvage a few points, and it is now clear that every single point will have its weight at the end of the season in such a close fight for the title. 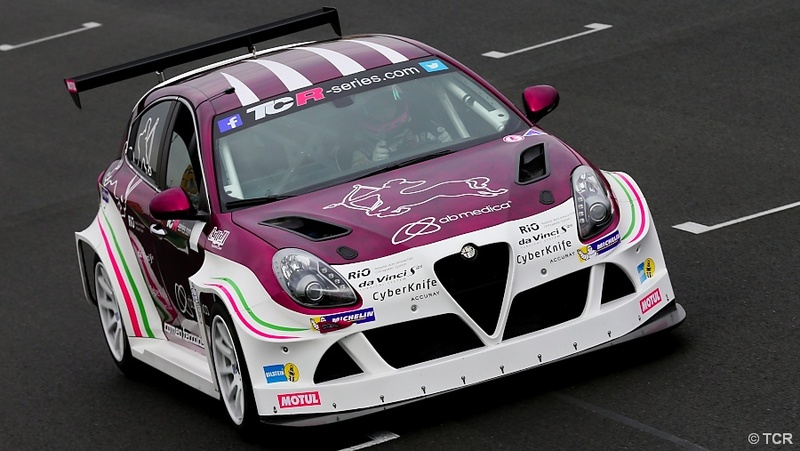 The German rounds yielded more interesting news, as the Alfa Romeo Giulietta cars showed great progress in performance, way beyond Michela Cerruti's P9 in Race 2, while some of the youngest guns of the series, like Attila Tassi (7th in Race 2) and Niklas Mackschin (who finished 9th and a 8th) put some strong showings in the close fights that delighted the fans. The TCR International Series will resume on July 2 and 3 at Sochi, Russia, for rounds 13 and 14. After dominating yesterday's Qualifying, B3 Racing Team's Dusan Borkovic and Mat'o Homola swapped positions in the first race and gave B3 Racing Team its first victory in the TCR International Series. Although he was able to exploit his pole position, Borkovic made a couple of mistake that dropped him behind his teammate. Homola had a spotless race and managed to keep his competitors at bay, with James Nash, Sergey Afanasyev and Antti Buri crossing the line behind the B3 Racing duo. In a race that was plenty of incidents and safety car interventions, Gianni Morbidelli and Pepe Oriola managed to survive, salvaging a seventh and tenth positions that might prove crucial in the title fight, while Stefano Comini was forced to retire. The two Mulsanne Racing's Alfa Romeo Giulietta cars were brilliantly running in seventh (Michela Cerruti) and eighth (Petr Fulín) when they were both stopped by mechanical failures in the final laps. With these results, Homola is the new championship leader, Nash is second, one point behind; Oriola and Comini are on equal points, with a gap of 11 from the leader. Craft-Bamboo Lukoil's Pepe Oriola ended a three-month drought and returned to victory with a convincing performance that helped him to regain the championship lead, though on equal points with his teammate James Nash. Dusan Borkovic and Nash encored their results from the first race and finished second and third once again. Stefano Comini completed a brilliant recovery to sixth after an incident at the start and a tough but fair fight with the up-and-coming youngsters Attila Tassi and Niklas Mackschin. Michela Cerruti was finally able to capitalize on the technical improvement made by the Alfa Romeo Giulietta and finished in a well-deserved ninth position. Two weeks after breaking his duck at Imola, where he claimed a maiden victory in the TCR International Series, Mikhail Grachev scored a second one in a row at the end of another race plenty of drama. The WestCoast Racing driver managed to survive a series of incidents and technical failures that eliminated some of the main players such as the Oriola brothers, Dusan Borkovic and Harald Proczyk. It was a sweet and sour race for Mulsanne Racing; Petr Fulín's Giulietta was eliminated in the incident at the start, while Michela Cerruti scored her first championship point. In terms of the championship fight, the result played in favour James Nash who finished second and Gianni Morbidelli, who was able to recover to fourth position after being involved in the incident with Jordi Oriola at the start. With Pepe Oriola out of the points and Stefano Comini classified eighth Nash moved up to third, with a gap of 19 points, while Morbidelli lies only one further point adrift. Weather conditions affected the results of the second race. Eventually was Jean-Karl Vernay who managed to make fewer mistakes than the other competitors and claimed his second victory of the season. Sergey Afanasyev was classified second and reached his first podium of the season so far, while Stefano Comini scored a third place that propelled him back on top of the Drivers' Championship standings. With Pepe Oriola sidelined by the technical failure that had stopped him in Race 1, four other top contenders - Gianni Morbidelli, Jordi Oriola and Mikhail Grachev - had their chances spoiled by a wrong tyre choice that forced them to pit for a change at the end of the formation lap. Eventually Morbidelli managed to recover until a sixth position that might prove crucial for his ambitions in the championship. The all-in-one-day event at Imola provided plenty of drama, glory for new faces and a shake-up on top of the Drivers' Championship. Stefano Comini (Leopard Racing Volkswagen Golf Gti) and Mikhail Grachev (WestCoast Racing Honda Civic) shared the race victories. It was the first one in the season so far for Comini and the first one ever for Grachev. Two other drivers were able to achieve the first podium results for themselves and their teams: Mat'o Homola (B3 Racing SEAT León) who was second in Race 2, and Davit Kajaia (Liqui Moly Team Engstler Volkswagen Golf Gti) who finished third in Race 1. The dark side of the day consisted in the merciless bad luck that hit Gianni Morbidelli and James Nash. They both had arrived in Imola with the hopes to move further up in the standings, but eventually came away empty-handed, and not because of their faults. Pepe Oriola was able to stay away of troubles and scored precious points that stretched his leadership to 15 points ahead of Comini, who is now his closest competitor. 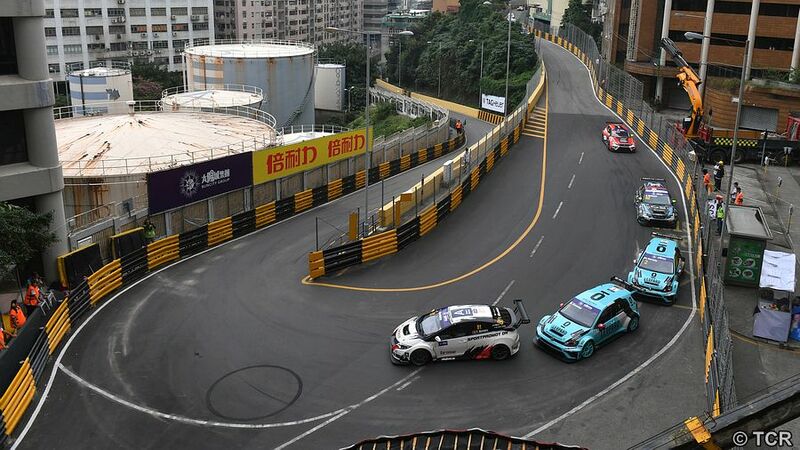 Maybe it a prelude to a repeat of last year's duel that ended up only at the last race in Macau. But it's not granted, because the fight is closer than ever and provides continuous surprises as it is proved by the fact that seven different drivers in three different types of cars have been victorious in the eight races held so far. The series will resume in fifteen days at the Salzburgring, Austria, on June 4 and 5, for rounds 9 and 10. Reigning champion Stefano Comini claimed his first victory of the season at the end of a race that was plenty of drama and gave Leopard Racing amd Volkswagen their second consecutive win after Jean-Karl Vernay's in Spa Race 2. The outcome of the first race in Imola spoke in favour of Pepe Oriola as far as the title fight is concerned, because the Spaniard's closest rivals - Gianni Morbidelli and James Nash - were both scoreless. The Italian seemed on the way to secure a comfortable win when a power steering failure resulted in a dramatic incident that involved his own teammate Alain Menu. As for Nash, he was first slowed down by engine misfire and then hit by another car. Door-to-door fights resulted in a number of contacts and clashes that eliminated or slowed down some of the top players such as Jordi Oriola, Borkovi c and Vernay. The Frenchman was later demoted from 6th to 12th by the Stewards who imposed him a double penalty for trespassing the limits of the track and for his incident with Borkovic. Attila Tassi, Carlotta Fedeli and Alessandra Neri managed to finish in seventh, ninth and tenth positions respectively and scored their first points in the championship. Motorsport can be funny sometimes. The very same car that had won Race 1 in Spa, was victorious in Race 2 at Imola, but with a different driver: Mikhail Grachev who has just joined WestCoast Racing in the place of Aku Pellinen. The Russian had reasons to rejoice, as this move granted him that first TCR race win he was chasing since last year. And the icing on the cake for him was that he took the lead overtaking the very same car he had driven until the previous event. Mat'o Homola finished second and climbed on the TCR podium for the first time, while Stefano Comini secured third place after an epic battle with Pepe Oriola. With both, Gianni Morbidelli and James Nash sidelined by technical issues, Oriola and Comini are now first and second in the Drivers' Championship, separated by only 14 points. Aku Pellinen has joined the club of TCR race winners, after taking a clear win in Race 1 at Spa, on a sunny Friday afternoon. Once again, the young Finn of WestCoast Racing took an excellent start from row 2 and kept the lead throughout the entire race with his Honda Civic TCR. Pepe Oriola and Dusan Borkovic concluded in second and third, after the Spaniard passed the Serbian on lap 1, both achieving their main goal of scoring heavy points. Mat'o Homola, Gianni Morbidelli, Kevin Gleason and Davit Kajaia took positions from 4th to 7th, after Jean-Karl Vernay and James Nash had ended their duel with a contact that cost several positions to the Briton (he eventually finished 8th) and a drive-through to the Frenchman, who dropped from fourth to 14th. The last points were scored by Sergey Afanasyev and Antti Buri who both had stalled at the start. It was an even worse day for Stefano Comini, as the reigning champion's car was stopped by a broken driveshaft before joining the grid. The young Attila Tassi had a scary shunt in the last lap, caused by a puncture, but luckily he escaped unhurt. Today's result have closed the gap at the top of the points standings, with Morbidelli leading now only by 2 points on Oriola and 6 on Nash. Attila Tassi was the lucky guy today in Spa-Francorchamps, as he suffered no consequences after a violent shunt in turn 12 (Pouhon) during the last lap of Race 1. The fearless young Hungarian seemed not shaken by the incident and even minimized what occurred: "Actually the accident was more spectacular than severe", he explained. "I had a puncture in one of the front tyres and went off. There was nothing I could do to avoid going straight into the tyre-wall. It was a big shunt but, luckily enough, the tyres are quite thick there and that limited the damage, although images on TV were quite dramatic." The relaxed attitude of the 16-year-old driver contrasted completely with the expression on the faces of the B3 Racing crews, still scared and relieved to see the jockey-sized Attila in one piece. "The most important thing is that Attila is ok. Even the car doesn't look too damaged and we'll do everything we can to repair it for tomorrow", confirmed team manager David Bári. After Tassi's accident in Bahrain and Borkovic's shunt in Estoril, another long night of work awaits the mechanics of the Hungarian team. The 2016 TCR International Series' first visit to Spa-Francorchamps resulted in an exciting weekend that heated up the championship further. After Aku Pellinen had claimed his maiden TCR victory in yesterday's Race 1 at the wheel of a WestCoast Racing Honda Civic, today it was Jean-Karl Vernay's turn to score a first win for himself and Leopard Racing. It was also the first success of a Volkswagen Golf Gti in the current season. These results meant that five different drivers and three different brands of car manufacturers have won in the six races held so far. Quite obviously the Drivers' championship's classification is extremely close. After Gianni Morbidelli had managed to jump on top of the standings at the end of Race 1, Pepe Oriola retook the leadership after Race 2. The Spaniard has now a two-point margin ahead of James Nash, while Morbidelli is third, two further points adrift. But the others are not far away. Pellinen, Stefano Comini, Vernay, Sergey Afanasyev, Mat'o Homola and Dusan Borkovic fill the positions from fourth to ninth, with the latter having a gap of 37 points from the leader. The championship will resume at Imola, Italy on May 22, for rounds 7 and 8. For a maiden win, it was a real triumph! 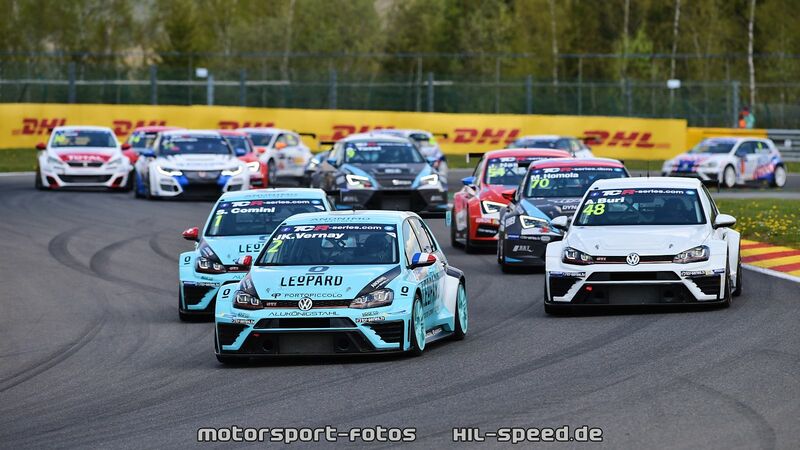 Leopard Racing conquered its first TCR success very close to its Luxembourg headquarters and signed a stunning 1-2-3 with its three drivers: Jean-Karl Vernay, Stefano Comini and guest TCR Germany racer Antti Buri. 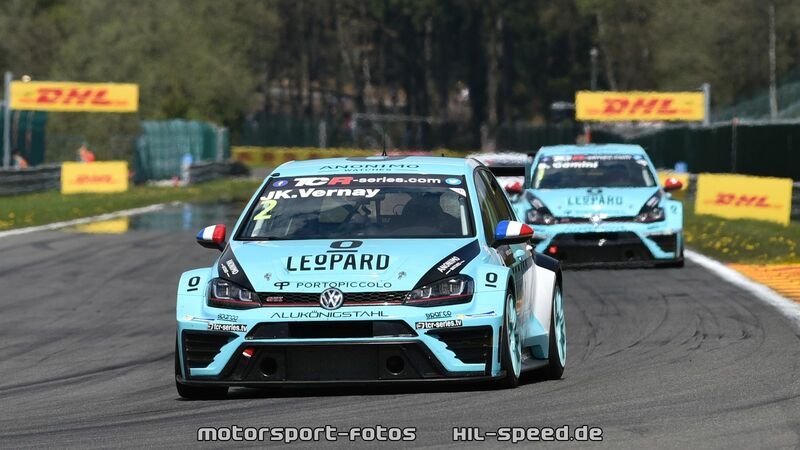 It was also the first victory of the year for the Volkswagen Golf Gti cars and the maiden TCR success for Vernay. The Frenchman has proven a quick adaptation to touring car racing and took a well-deserved victory after a close duel with teammate and reigning champion Comini. Mat'o Homola and Aku Pellinen took fourth and fifth respectively after a relatively trouble-free race, while James Nash, Pepe Oriola, Kevin Gleason and Sergey Afanasyev animated the final laps with a close fight the for sixth position. Local hero Pierre-Yves Corthals took the last point in a race that saw much action at the back of the field, with the Peugeot 308 cars shining in the first part of the race, when Jimmy Clairet ran as high as eighth. Following today's races, the situation in the championship is closer than ever, with the three first drivers (Oriola, Nash and Morbidelli) covered by only 4 points. The third race meeting of the TCR International Series takes place this week at Spa-Francorchamps, a legendary racetrack in motorsport history. The 7-kilometre circuit - one of the longest permanent tracks - winds up the Ardennes hills in South-East Belgium. Inaugurated in 1922 as an open-road course, the circuit underwent many changes during the years; the current layout dates back to 2007. It has been home to 49 editions out of 61 of the F1 Belgian GP, from 1950 to 2015. This weekend the TCR International Series is part of the 6 Hours of Spa, second round of the FIA World Endurance Championship. And this resulted in an adjustment of the usual format. The drivers will hit the track first on Thursday, for two 30-minute Free Practice sessions; the Qualifying will take place Friday in the early afternoon, followed by the first Race in the late afternoon. Race 2 will start on Saturday at lunch time. The Belgian event will mark the first appearance of the Peugeot brands in a TCR competition. Two Peugeot 308 Racing Cup cars have been entrusted by Peugeot Sport to the Sébastian Loeb Racing for racing at Spa, and the team has chosen Grégory Guilvert and Jimmy Clairet to drive the two Peugeot 308 Racing Cup cars in the TCR International Series event, next week at Spa-Francorchamps. "We are proud that Peugeot Sport has entrusted the two cars to our team for their maiden appearance in the TCR International Series. We hare happy to take this responsibility, as our team is ambitious and always looking for delivering the best performance. Thanks to Peugeot Sport we may count on the experience of Guilvert who has developed the car. As for Clairet, he's a young and fast driver, and very motivated. We have a strong pair of drivers that will help us to make a good job," said the team's sporting director Franck Tiné. The 34-year-old Guilvert is a test driver for Peugeot Sport and took part in the technical development of racing cars such as the RCZ Racing Cup, the 208 T16 Pikes Peak and, more recently, the 308 Racing Cup. His racing CV includes the title in the 2009 Peugeot Spider Cup and race victories in the French Supertourisme, the European GT Championship and the Blancpain Endurance Series. 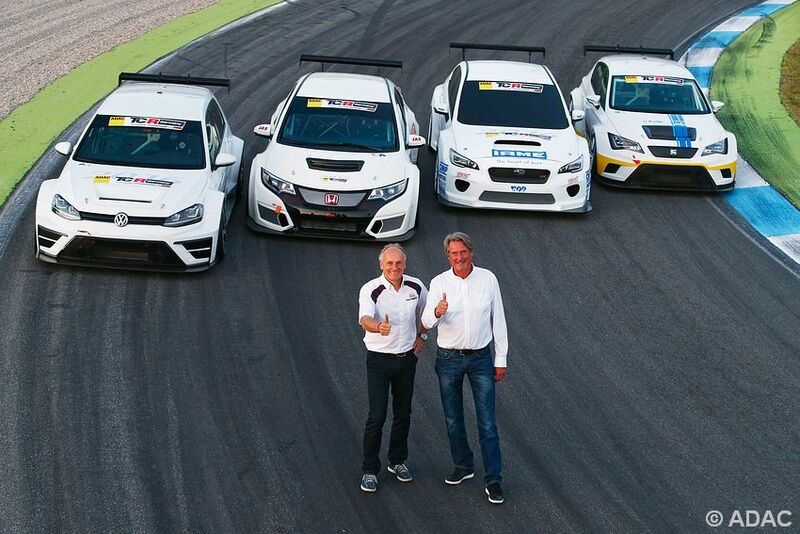 "As test driver of the 308 Racing Cup I am thrilled to drive the car in an actual race meeting. We have to face a unique racetrack and a top-level championship, which makes me approach this task humbly, but with a lot of motivation because I very much wish to show the potential of the car in both, performance and reliability," he said. Clairet, 25-years old, only began racing in the 2013 Peugeot 208 Racing Cup in which he finished as vice-champion in 2014, behind his brother Teddy. 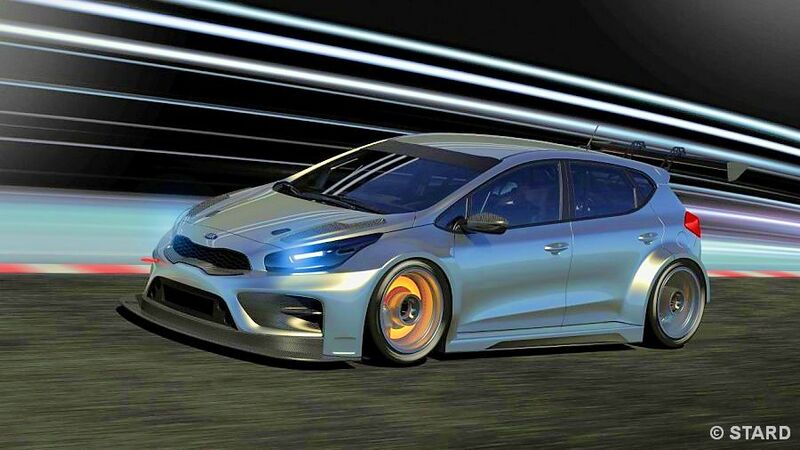 Last year he was classified 6th in the French Renault Clio Cup. "I am excited by the opportunity of driving the 308 Racing Cup. Especially because it is a car entrusted directly by Peugeot Sport to Sébastien Loeb Racing. This is a prestigious step in my racing career. 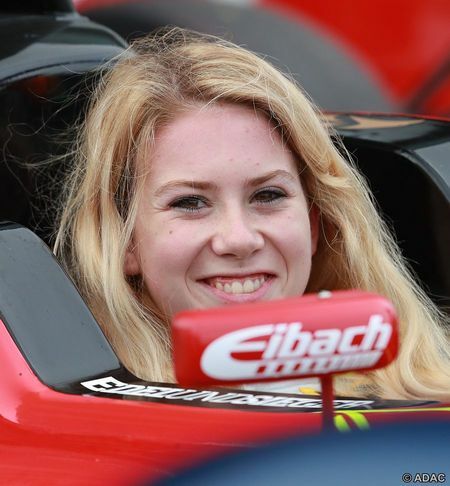 I can't wait to race at Spa and I will do my very best to achieve a good result," echoed Clairet. The TCR International Series welcomes two new drivers for the Belgian event at Spa-Francorchamps. Local hero Pierre-Yves Corthals and Finland's Antti Buri will join the field this weekend. One of the most experienced touring car drivers in Belgium, Corthals (in the picture) was crowned champion a stunning six times in the national and international Renault trophies; he also claimed victories and podium results in Super Production championships as well as competing in the European and the World Touring Car championships. 'Pilou' - as he his better known - returns to circuit racing after a break and will be at the wheel of a SEAT León of the Netherlands-based Ferry Monster Autosport that will also run Loris Hezemans' sister car. Corthals' car will sport the colours of the new TCR Benelux series. As for the 27-year-old Buri, he will drive a Volkswagen Golf Gti run by the Belgian outfit WRT. 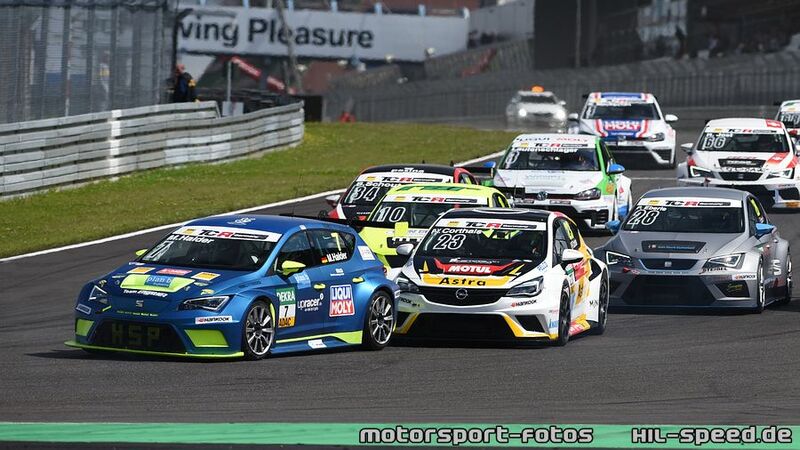 The young Finn is in great form; he is taking part in the new ADAC TCR Germany with a LMS Racing SEAT León and last Sunday at the Sachsenring claimed a brilliant victory in the fourth round of the championship. Both Top Run Motorsport and Mulsanne Racing have elected to skip the next event of the TCR International Series that takes place this weekend at Spa-Francorchamps. The two Italian outfits - that are developing and running a Subaru WRX STi and an Alfa Romeo Giulietta respectively - have chosen to take a break and focus on upgrading their cars. Top Run team manager Renato Russo explained: "Following the meeting we had in Tokyo with Subaru STi, we agreed on some technical improvements and we were also provided some new parts that are better suited to the TCR regulations. Therefore, bearing in mind the advice we received from Luca Rangoni after the races in Portugal, we have reluctantly decided to skip Spa and produce the maximum effort to run the final version of the TCR car in the following event." A press release from Romeo Ferraris engineering company stated: "Our Alfa Romeo Giulietta TCR hit teething problems in the first two events of the season. Problems have been identified and are about to be solved. However we need to check these technical solutions and will do it in the next weeks. For this reason we have taken the hard decision of not racing in Spa and come back in the following events with a more competitive car." TCR promoter Marcello Lotti commented: "We know that it takes time to develop new racing cars. The growth of TCR has been so quick that some of the companies that are building them struggle to keep up with the pace. For a team is always tough to elect to skip a race weekend, so these decisions show how much Top Run and Mulsanne are keen to make their cars efficient and reliable. It's true that we currently lack some cars, but it is clear that the field will be growing as the season goes on." 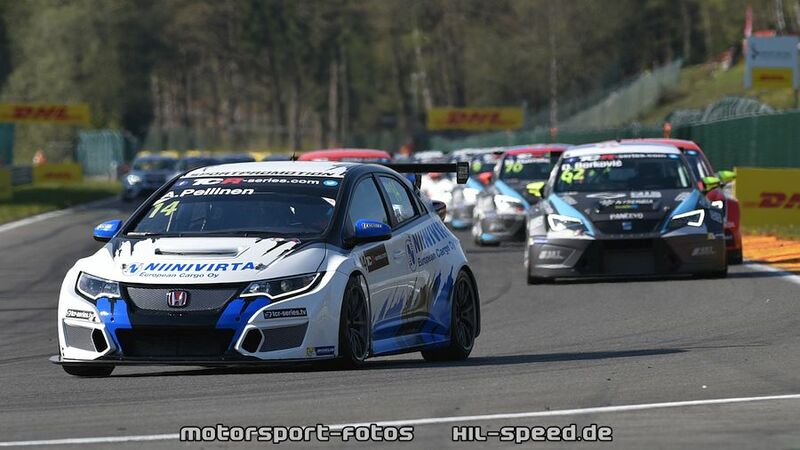 After taking the lead of the Drivers' championship with a victory and a second place in Estoril, Gianni Morbidelli will race at Spa carrying the maximum success ballast of 30 kilos on board his WestCoast Racing Honda Civic TCR. 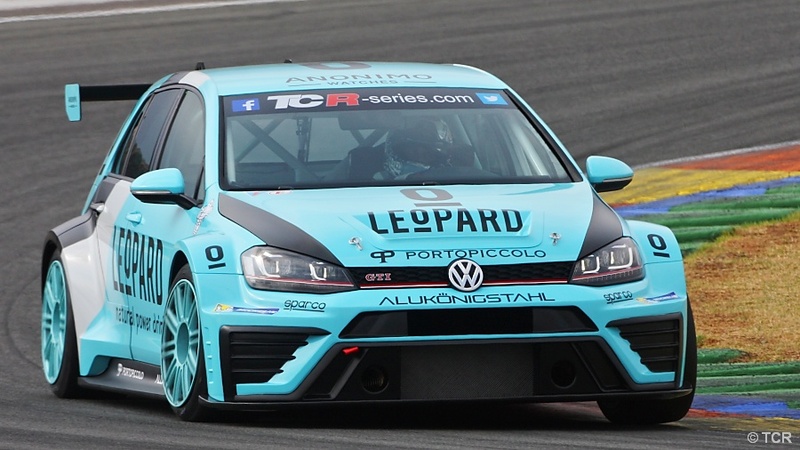 The Leopard Racing Volkswagen Golf Gti TCR of 2015 champion Stefano Comini, that finished third and second in the Portuguese races, will be laden by 20 extra kilos. 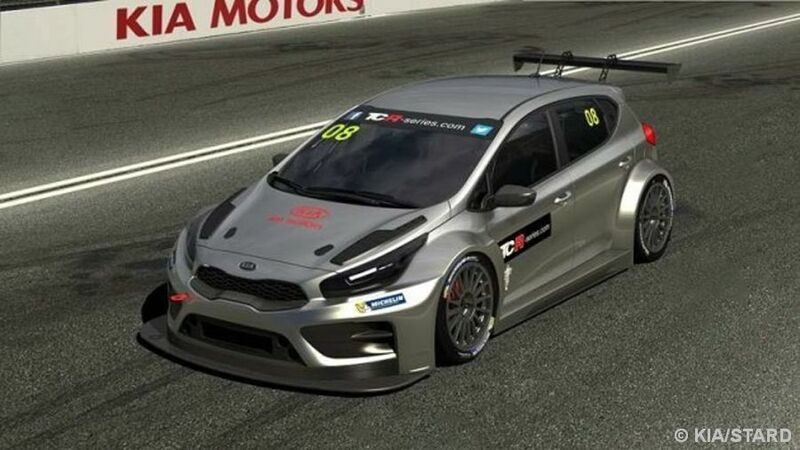 The lightest success ballast of 10 kilos will be imposed to James Nash's SEAT León TCR of Craft-Bamboo Lukoil; the Briton won the second race at Estoril and is now second in the Drivers' championship, only one point short of Morbidelli. Die Firma STARD (Stohl Advanced Research and Development) aus Groß-Enzersdorf in Österreich präsentiert eine spezielle Entwicklung des KIA Cee'd zum Einsatz bei der TCR Serie. Weitere detaillierte Informationen über das vorgestellte Fahrzeug werden in den nächsten Wochen mitgeteilt. Starke Lokalmatadore, ein Bob-Pilot und spannende Rennaction: Nach der erfolgreichen Premiere der ADAC TCR Germany in Oschersleben geht es auf dem Sachsenring vom 29. April bis 1. Mai in das zweite Rennwochenende der neuen Tourenwagenserie des ADAC. Auf dem sächsischen Traditionskurs bei Hohenstein-Ernstthal stehen am Samstag (12.00 Uhr) und Sonntag (10.25 Uhr) die Saisonläufe drei und vier auf dem Programm. Neben Steve Kirsch (36, Chemnitz) und Dominik Fugel (19, Chemnitz/beide ADAC Sachsen) im Honda Civic TCR gibt sich ein weitere Lokalmatador die Ehre: René Münnich (38, Friedersdorf/all-inkl.com) absolviert einen Gaststart in einem weiteren Honda. SPORT1 überträgt das erste Rennen am Samstag ab 11.55 Uhr live, zudem gibt es beide Rennen unter www.adac.de/motorsport im Livestream. Die 3,645 Kilometer lange Strecke ist äußerst anspruchsvoll und gehört zu den schwierigsten Kursen im Rennkalender. Enge Kurven, Hochgeschwindigkeitspassagen und hügeliges Gelände wechseln sich ab - das Terrain und das starke Fahrerfeld garantieren hochklassige und spannende Rennen. Gerade auf dem anspruchsvollen Sachsenring kommt dem Qualifying eine besondere Bedeutung zu. Am Freitag haben die Piloten in zwei Freien Trainingseinheiten (10.45 und 15.20 Uhr) zunächst die Möglichkeit, den Kurs kennenzulernen, Abläufe zu proben und die Ideallinie zu finden. Spätestens am Samstagmorgen (08.00 Uhr) wird es aber ernst, wenn es im Zeittraining gegen die Uhr um die Startplätze für das erste Rennen geht. In den beiden Rennen in Oschersleben hatte jeweils Josh Files (25, Großbritannien, Target Competition) die Nase vorn, er führt die Gesamtwertung mit 51 Punkten an. Hinter ihm folgen Benjamin Leuchter (28, Duisburg, Racing One) mit 34 und Harald Proczyk (40, Österreich, HP Racing) mit 30 Punkten. In der Teamwertung liegt Target Competition, das im vergangenen Jahr den Sieger in der erstmals ausgetragenen TCR International Series gestellt hatte, ebenfalls vorne. VW-Pilot Leuchter sieht die Seat-Mannschaft aus Italien auch auf dem Sachsenring in der Favoritenrolle. "Target Competition muss man immer auf der Liste haben", sagt der Gesamt-Zweite, der zuletzt vor zehn Jahren am Sachsenring gestartet ist, damals eine Pole herausfuhr und von daher mit guten Erinnerungen zum Traditionskurs reist: "Die Strecke gefällt mir sehr gut. Wir werden unsere Chance suchen, auch wenn es schwierig wird. Aber ich bin topmotiviert und peile einen Platz in den Top Fünf an." Zum Heimrennen tritt das Team ADAC Sachsen mit den Piloten Steve Kirsch (36, Chemnitz, Team Honda ADAC) und Dominik Fugel (19, Chemnitz, Team Honda ADAC) an. Kirsch hatte mit seinem Honda Civic TCR in Oschersleben das Qualifying gewonnen und sich mit der ersten Pole-Position einen Eintrag in den Geschichtsbüchern der ADAC TCR Germany gesichert. Fugel führt nach zwei von 14 Rennen die Wertung im ADAC TCR Junior Cup mit 43 Punkten an. "Auf der einen Seite ist es schön, dass wir zu Saisonbeginn das Rennen am Sachsenring haben und den Vorteil gegenüber den anderen vielleicht ein bisschen nutzen können. Auf der anderen Seite hätte ich es gerne zum Ende der Saison gehabt, weil wir bis dahin das Auto sicher noch ein bisschen besser kennen werden. Aber wir sind hochmotiviert, haben auch ein bisschen Extra-Druck. Alle Mitarbeiter, Sponsoren, Familie und Verwandte gucken bei diesem Rennen natürlich auf uns", sagt Steve Kirsch. "Wir haben uns in Oschersleben gut verkauft. Mit der Pole hätte ich nicht unbedingt gerechnet. Hätte ich den Fehler in der ersten Kurve nicht gemacht, wäre vielleicht auch noch mehr gegangen. Das wollen wir hier am Sachsenring besser machen." Die Fahrer können sich am Sachsenring im Übrigen auf einen prominenten Motorsport-Fan freuen, der die Siegerehrungen durchführen wird. Nico Walther, geboren in Freital und einer der besten deutschen Bob-Piloten - unter anderem Sieger der kombinierten Weltcup-Wertung im Zweier und Vierer 2016 sowie Vize-Weltmeister im Viererbob 2015 - wird die besten Fahrer auf dem Podium ehren. Mat'o Homola and B3 Racing Team won their first pole position on their second appearance in the TCR International Series. Once again it was a very close session, with the ninth fastest drivers covered by only six tenth and three different brands - SEAT, Honda and Volkswagen - filling the top-three positions within three tenths. The young Slovak and his SEAT edged out the rest of the field with an impressive lap of 1:48.518 that was posted on their first run in Q2. Gianni Morbidelli placed his WestCoast Racing Honda in second position, only 0.155 seconds behind the poleman (1:48.673). The Leopard Racing duo of Jean-Karl Vernay and Stefano Comini fought for the third position until the very end; eventually the Frenchman's 1:48.860 beat the reigning champion's 1:48.965 by one tenth. After topping the time sheet in Q1, Pepe Oriola qualified in a disappointing seventh position, while Loris Hezemans was classified tenth and won pole position on the reverse grid for the second race. The first race will start tomorrow at 11:25 local time on the distance of 15 laps, with the green light for the second race at 17:05. It took only one lap to Pepe Oriola for posting the fastest lap at the beginning of the session. His time of 1:49.231 was nearly two tenths faster that everybody else's. Jean-Karl Vernay (1:49.424) climbed to second fastest in the latest moments, demoting Mat'o Homola (1:49.479) to third. After aborting one attempt due to a mistake, Gianni Morbidelli salvaged the situation with a last lap of 1:49.508 that placed him in fourth, ahead of Stefano Comini and James Nash. The leg was disrupted by the red flag after only four minutes, when Dusan Borkovic lost his car and hit the barrier head-on at Turn 3. The following drivers advanced to Q2: Oriola, Vernay, Homola, Morbidelli, Comini, Nash, Afanasyev, Gleason, Pellinen, Hezemans, Kajaia and Tassi. They were all covered by only nine tenths of a second. Mat'o Homola's SEAT set an impressive fastest lap of 1:48.518 that was good enough for claiming pole position. The other drivers did their best and improved their times, but not enough. Gianni Morbidelli managed to post the second best lap (1:48.673), while Jean-Karl Vernay (1:48.860) beat his teammate Stefano Comini (1:48.965) for third. Gelungene Premiere der ADAC TCR Germany: Im Debütrennen der neuen Tourenwagenserie des ADAC hat Josh Files (24, Großbritannien, Target Competition) im SEAT Leon Cup Racer einen überzeugenden Sieg gefeiert. Am Samstagmittag setzte sich Files in Oschersleben gegen Benjamin Leuchter (28, Duisburg, Racing One) im VW Golf GTI TCR und Pascal Eberle (25, Schweiz, Steibel Motorsport) in einem weiteren SEAT durch. Die Fans in der Motorsport Arena erlebten eine tolle Premiere. Nach dem Start übernahm Leuchter im VW die Führung, nachdem Pole-Setter Steve Kirsch (36, Chemnitz, ADAC Sachsen e.V.) im Honda Civic TCR bei der Anfahrt zur ersten Kurve einen Umweg nehmen musste und weit zurückfiel. 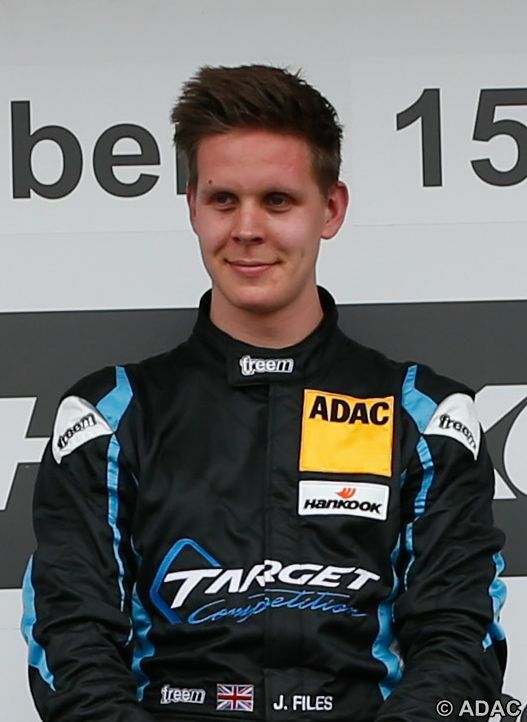 Aufgrund einer Startkollision zwischen ADAC Formel 4-Umsteiger Tim Zimmermann (19, Langenargen, Liqui Moly Team Engstler) und Youngster Mike Beckhusen (16, Berlin, Target Competition) ging in der Startrunde für zehn Minuten das Safety Car auf die Bahn. Während Leuchter die Führung nach dem Restart verteidigte, lauerte Files beharrlich auf seine Chance und zog knapp neun Minuten vor dem Ende am VW-Piloten Leuchter vorbei. Einmal vorne, ließ sich der 24 Jahre alte Brite die Führung nicht mehr nehmen. Schnell fuhr Files ein Polster heraus und siegte mit 3,818 Sekunden Vorsprung vor Leuchter und Eberle. Hinter dem Trio folgte der ehemalige ADAC GT Masters-Pilot Harald Proczyk (40, Österreich, HP-Racing) vor seinen SEAT-Markenkollegen Bas Schouten (21, Niederlande, ST Motorsport), Antti Buri (28, Finnland, LMS Racing) und Mike Halder (20, Wiggensbach, Liqui Moly Team Engstler). Pole-Setter Steve Kirsch belegte den achten Platz vor den SEAT-Piloten Mario Dablander (28, Österreich, Seat Austria) und Jürgen Schmarl (42, Österreich, Target Competition). Der Sieg in der Junior-Wertung ging an Dominik Fugel (19, Oberlungwitz, Team Honda ADAC) im Honda Civic TCR. Im zweiten Rennen am Sonntag wird Antti Buri auf der Pole-Position stehen. Er belegte im Qualifying für das erste Rennen in seinem SEAT Leon Cup Racer in 1:36:488 Rang zehn. Im zweiten Rennen starten die zehn schnellsten Fahrer des Qualifyings in umgekehrter Reihenfolge. Der Brite Josh Files (24, Target Competition) hat bei der Premiere der ADAC TCR Germany in der Motorsport Arena Oschersleben vor mehr als 20.000 Zuschauern am Wochenende einen Doppelsieg gefeiert. Nach seinem Auftakterfolg im ersten Rennen am Samstag siegte Files im SEAT Leon Cup Racer von Startplatz sechs auch im zweiten Lauf am Sonntag. Der ehemalige ADAC GT Masters-Pilot Harald Proczyk (40, HP-Racing) und Jürgen Schmarl (42, Target Competition) landeten auf den Plätzen zwei und drei. Auch die beiden Österreicher waren in einem SEAT unterwegs. "Ich bin überglücklich. Das Team hat wieder einen überragenden Job gemacht. Es war alles andere als leicht, ein hartes Stück Arbeit. Ich konnte mir aber eine kleine Lücke erarbeiten und diese zum Glück bis zum Schluss halten", sagte Files, der das erste Rennwochenende der ADAC TCR Germany damit mit der Maximalausbeute von 50 Punkten beendete. Proczyk hat ebenso 30 Punkte wie VW Golf-Pilot Benjamin Leuchter (28, Duisburg, Racing One). "Die ADAC TCR Germany hat an diesem Wochenende mit einer tollen Premiere überzeugt", sagt ADAC Sportpräsident Hermann Tomczyk zum Debüt der neuen Serie. "Wir haben an diesem Wochenende tollen Sport gesehen. Sehr beeindruckt hat mich, dass das Feld in den ersten beiden Rennen sehr dicht zusammen lag." Die technische Abteilung der TCR International Series hat die 'Balance of Performance' Gewichte (BoP) bei einigen Fahrzeugen geändert. Dies wurde auf Basis der Bahrain-Ergebnisse ermittelt und entsprechend neu berechnet. Die neuen Gewichte gelten ab der TCR Germany Veranstaltung am 16./17.4.2016 in Oschersleben. SPORT1 erweitert sein bestehendes Motorsport-Programmangebot im TV um die TCR International Series. Regelmäßiger Ausstrahlungstermin im Free-TV ist der Samstag nach den jeweiligen Rennwochenenden. Die Highlights des Saisonauftakts der TCR International Series in Bakhir /Bahrain gibt es am kommenden Samstag, 9. April, ab 11:00 Uhr auf SPORT1 zu sehen. Nach der erfolgreichen Premiere in der Vorsaison ist die TCR International Series auch in diesem Jahr wieder rund um den Globus unterwegs. Dabei gehen kostengünstige Tourenwagen der TCR-Kategorie von insgesamt sechs Herstellern an den Start. Mit dabei sind der Seat León, der Volkswagen Golf Gti, der Honda Civic, der Opel Astra, der Subaru STi und der Alfa Romeo Giulietta. Insgesamt werden in der Saison 2016 elf Wochenenden mit je zwei Sprintrennen in Europa und Asien absolviert. Am 18. und 19. Juni gastiert die Serie auch in der Motorsport Arena Oschersleben, wo das deutsche Liqui Moly Team Engstler ein Heimspiel hat. In Oschersleben werden dann auch die beiden deutschen Serien ADAC Formel 4Ralf Schumacher wechselt auf den Kommentatorenstuhl und ADAC TCR Germany gastieren, über die SPORT1 im Rahmen des ADAC GT Masters ebenfalls umfangreich im TV berichtet. Jedes Rennwochenende der TCR International Series wird am darauffolgenden Samstag in einer halbstündigen Highlight-Sendung auf SPORT1 zusammengefasst. Zudem sind die Sendungen auch auf SPORT1+ zu sehen. Kommentiert werden die Übertragungen von Hannes Biechteler oder Peter Kohl, der auch beim deutschen Pendant der Serie, der ADAC TCR Germany, am Mikrofon im Einsatz ist. 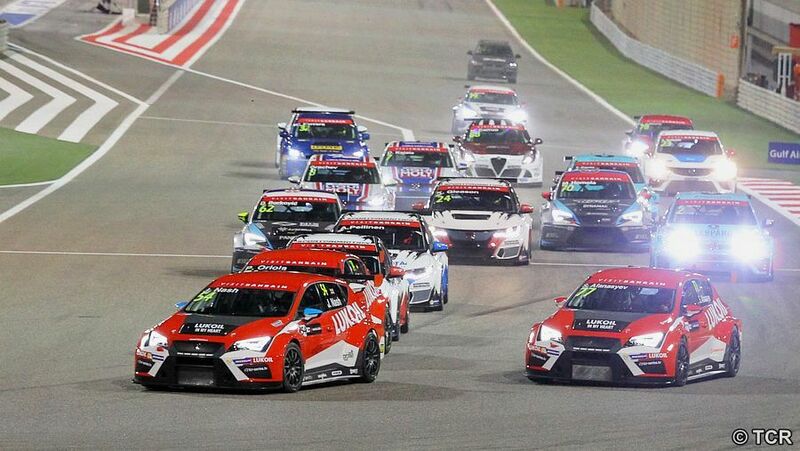 The 2016 TCR International Series kicked off with a breath-taking night race during the Bahrain Formula 1 Grand Prix. 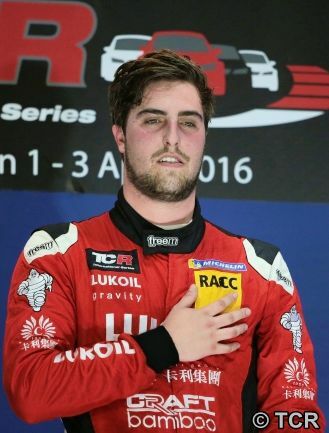 The 2015 vice-champion Pepe Oriola started his new campaign on a high note; with a spotless performance the young Spaniard drove his SEAT León of Team Craft-Bamboo Lukoil to claim an authoritative victory. Oriola got the better of his team-mates James Nash and polesitter Sergey Afanasyev during the first lap, then was able to control Nash's attacks in the early stages and the return of Gianni Morbidelli's Honda Civic in the final laps. 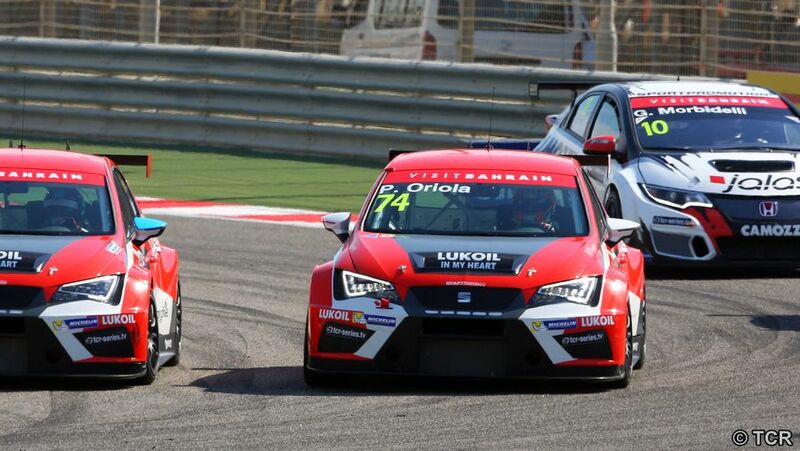 Pepe Oriola [# 74] performed an encore at the Bahrain International Circuit. After victory in yesterday's night Race 1, the Spanish driver and his SEAT León won the second race in a sunny and hot day. Oriola managed to recover from the sixth position on the grid and took the lead from Kevin Gleason's Honda Civic on lap 8 of 10. He eventually crossed the line ahead of James Nash in a 1-2 finish for Team Craft-Bamboo Lukoil. Die ADAC TCR Germany startet mit einem interessanten Feld in ihre Debütsaison. Für die erste Saison der neuen Tourenwagenserie, die vom 15. bis 17. April im Rahmen des ADAC GT Masters in der Motorsport Arena Oschersleben startet, haben elf Teams insgesamt 22 Tourenwagen genannt. Neben deutschen Teilnehmern sind auch Teams aus Italien, Finnland und der Schweiz am Start. Gefahren wird mit seriennahen, aber leistungsstarken Tourenwagen. Zum Einsatz kommen die 330 PS starken Kraftpakete Seat Leon, Opel Astra, Honda Civic und VW Golf. 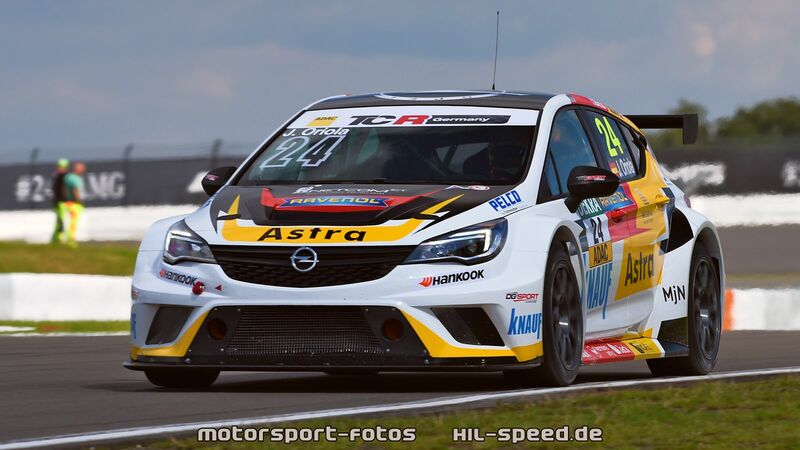 Lubner Motorsport Opel Astra ? LMS Racing Seat Leon ? HP Racing Seat Leon ? TOPCAR Sport Seat Leon ? 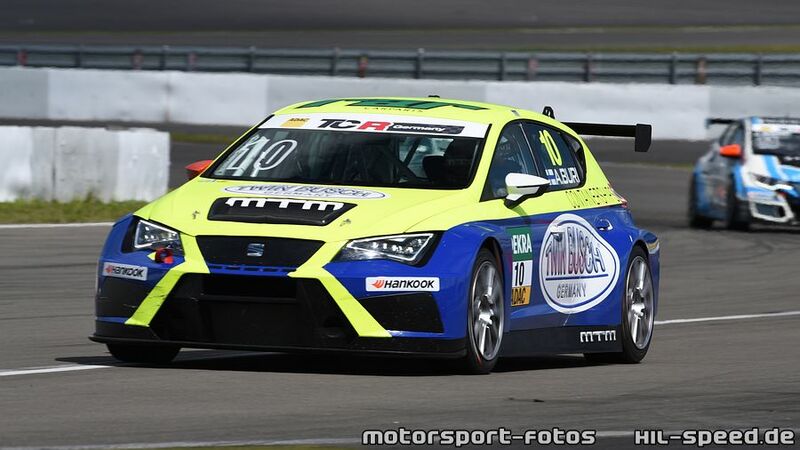 Steibel Motorsport Seat Leon ? Wolf-Power Racing Seat Leon ? 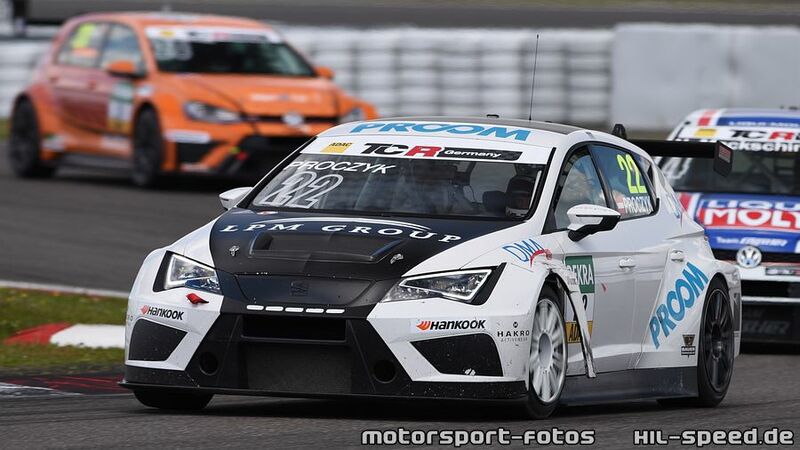 JBR Motorsport Seat Leon ? Aufgrund von Lieferengpässen der neuen TCR-Tourenwagen zum Saisonstart, resultierend aus der weltweit hohen Nachfrage an der neuen Klasse, wird sich das Feld der ADAC TCR Germany voraussichtlich erst zur Saisonmitte in der vollen Größe der 22 Teilnehmer präsentieren. Die vollständige Teilnehmerliste der ADAC TCR Germany 2016 wird im Rahmen des offiziellen Medientags von ADAC Formel 4, ADAC GT Masters und ADAC TCR Germany am 4. April in der Motorsport Arena Oschersleben veröffentlicht. Das Team WRT will in der anstehenden Saison der weltweiten TCR Serie als technischer Partner des Leopard Racing Teams einsteigen. Es werden zwei Fahrzeuge eingesetzt - ein GTI für den amtierenden Champion Stefano Comini (CH) und für Jean-Karl Vernay (F) das zweite Fahrzeug. Dies ist ein bedeutender Schritt in der Weiterentwicklung des W-Racing Teams, denn 'Touring Cars' sind neu für WRT. Das Team WRT glaubt fest an das Konzept der »TCR« und ist froh, jetzt in der TCR International Series mit Leopard Racing beteiligt zu sein und die Partnerschaft zu vertiefen, die ja schon im GT-Bereich im letzten Jahr gestartet wurde. Verschiedene Teams, die an der TCR International Series in diesem Jahr teilnehmen wollen, testeten für zwei Tage auf dem Circuito Ricardo Tormo in Valencia (Spanien). - Der Subaru STI kam erst zum zweiten Testtag auf die Strecke und war hauptsächlich wegen der Balance of Performance Ermittlung dort. Die Teilnahme von Peugeot mit einem Peugeot 308 Racing Cup Fahrzeug war etwas überraschend. Florent Meilhaud, Verantwortlicher für das 2RM Projekt bei Peugeot Sport erklärte die Situation: "Seit letztem Jahr, als wir das Peugeot 308 Racing Cup Projekt starteten, wurde uns klar, daß dieses Fahrzeug den Geist der TCR perfekt trifft. Die logische Konsequenz war, den Promotor der TCR-Serie anzusprechen und zu testen, wie das Auto in's Championat passt." 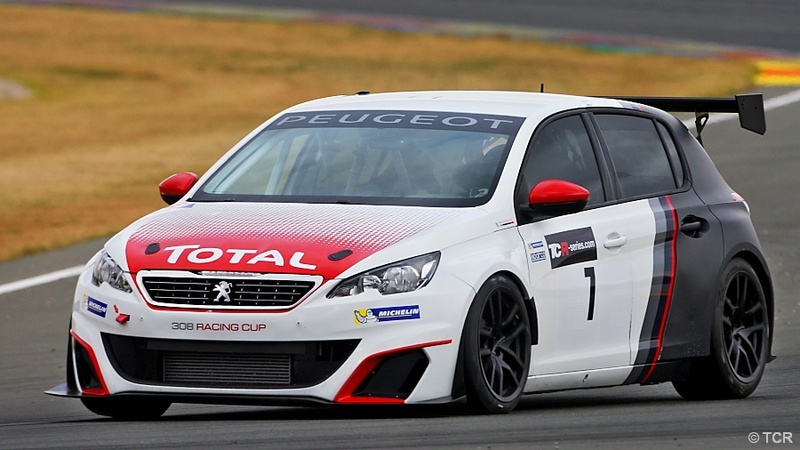 Der Peugeot 308 Racing Cup ist allerdings mit einem 1,6 Liter Motor ausgestattet. Durch die BoP kann eventuell das Auto so angepasst werden, daß es konkurrenzfähig sein kann. Noch knapp vier Wochen, dann springt die Startampel bei der ADAC TCR Germany zum ersten Mal auf Grün. Vom 15. bis 17. April feiert die neue Tourenwagenrennserie im Rahmen des ADAC GT Masters in der Motorsport Arena Oschersleben bei Magdeburg ihre Premiere. Die sportlichen Rahmenbedingungen der ADAC TCR Germany stehen fest, das Reglement für die 14 Rennen bei den sieben Veranstaltungen der Premierensaison wird in den kommenden Tagen veröffentlicht. Das sportliche Reglement der ADAC TCR Germany entspricht im wesentlichem dem Reglement der internationalen TCR-Serie. Die Rennen der ADAC TCR Germany werden bei SPORT1 im Free-TV übertragen, alle Tourenwagen der Serie starten auf Reifen von Exklusivreifenpartner Hankook. Tickets für die ADAC TCR Germany sind im Vorverkauf online unter www.adac.de/motorsport erhältlich. Die Serie umfasst sieben Veranstaltungen mit 14 Rennen in Deutschland sowie auf dem Red Bull Ring in Österreich und dem Circuit Park Zandvoort in den Niederlanden. Es wird eine Fahrerwertung ausgeschrieben, der Starter mit den meisten Punkten nach 14 Rennen ist der "Gesamtsieger ADAC TCR Germany 2016". Teilnahmeberechtigt sind Fahrzeuge nach dem internationalen TCR-Reglement. Angetrieben werden die Tourenwagen wie Honda Civic, Opel Astra, Seat Leon und Volkswagen Golf von Zweiliter-Turbomotoren mit rund 330 PS. Es ist ausschließlich Frontantrieb zugelassen, alle Fahrzeuge der ADAC TCR Germany starten auf Einheitsreifen von Exklusivpartner Hankook. Ein System der Fahrzeugeinstufung stellt die Chancengleichheit sicher. Jedes Rennwochenende beginnt mit zwei Freien Trainings über 30 Minuten, in denen sich die Fahrer mit den Strecken vertraut machen können. Es folgt ein Qualifying: Das Qualifying geht für alle Starter über 20 Minuten. Die zeitschnellsten 12 Fahrer des Qualifyings kämpfen anschließend in einem "Shoot Out" zehn Minuten um die Pole Position. In den zweiten Lauf starten die zehn Schnellsten des Shoot Outs in umgekehrter Reihenfolge, der zehntplatzierte startet so im zweiten Rennen von Position eins, der Fahrer der die Pole-Position für das erste Rennen herausgefahren hat, geht im zweiten Lauf von Position zehn an den Start. Ab Position 11 gehen die Piloten auch im zweiten Rennen in der Reihenfolge des Qualifyings ins Rennen. An jedem Wochenende werden zwei Rennen ausgetragen, eins am Samstag, das zweite am Sonntag. Jeder Lauf wird über 30 Minuten ausgetragen, der Start erfolgt stehend. Der Sieger eines Rennens erhält 25 Punkte, der Zweitplatzierte 18, der Drittplatzierte 15, absteigend bis zum Zehntplatzierten, der einen Punkt erhält. Die Punktevergabe im Überblick: Platz 1/25 Punkte - 2/18 - 3/15 - 4/12 - 5/10 - 6/8 - 7/6 - 8/4 - 9/2 - 10/1. Auch den fünf Besten des Qualifyings werden Punkte für die Gesamtwertung gutgeschrieben: Der Erstplatzierte erhält fünf Punkte, der Zweitplatzierte vier Punkte absteigend bis zum Fünftplatzierten, der einen Punkt erhält. Bei Punktegleichstand im Endklassement entscheidet die Anzahl der Siege, der zweiten Plätze und der weiteren Platzierungen. Ausgeschüttet werden Preisgelder und Sachleistungen in Höhe von insgesamt 150.000 Euro. 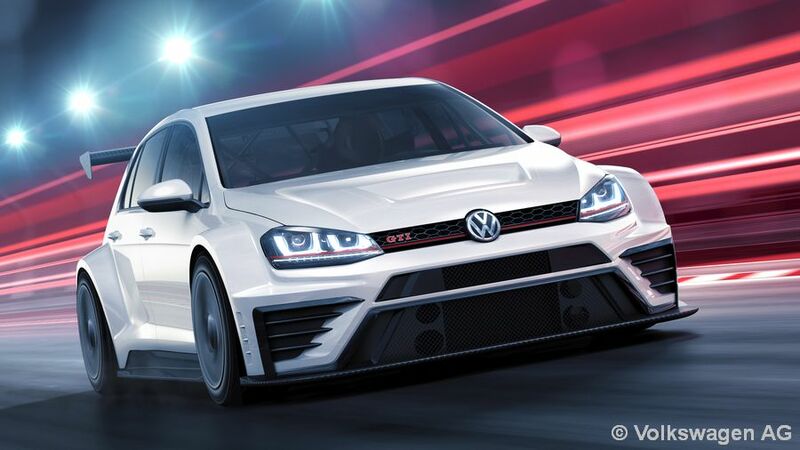 Der neue Volkswagen Golf GTI TCR hat das Gütesiegel im Namen: 40 Jahre nach der Präsentation des ersten Golf GTI bekommt auch die Version für den Kundensport jenes Kürzel, das beim Automobilhersteller aus Wolfsburg seit 1976 für sportlichen Charakter, kraftvolle Motoren und maximale Leistung steht. Seit der ersten Vorstellung im Juli 2015 erfreut sich der Golf für die Rennstrecke großer Beliebtheit: Bereits Mitte Januar waren alle Kundensport-Modelle für die Saison 2016 vergriffen. Die Teams können die 20 von Volkswagen Motorsport entwickelten Fahrzeuge in bis zu 16 nationalen und internationalen TCR-Tourenwagenmeisterschaften einsetzen. Ab dem 11. März sollen die Fahrzeuge für die internationale TCR-Meisterschaft in Abrera/Barcelona (E) an die Kundensport-Teams übergeben werden. Ein erstes Roll-out mit der Konkurrenz ist bei Testfahrten ab dem 14. März in Valencia (E) auf dem Circuit Ricardo Tormo geplant. Das Kürzel GTI für 'Gran Turismo Injektion' ist nicht nur ein Gütesiegel, es ist Markenzeichen und Identität. Schon optisch zeigt der Golf seine Rennsport-Gene: 18-Zoll-Rennfelgen, ein - verglichen mit dem Serien-Golf - um etwa 40 Zentimeter breiteres Fahrwerk sowie ein markanter Heckflügel sorgen zudem für ein optimales Fahrverhalten. Ein aerodynamisch geformter Frontsplitter gehört ebenso wie ein Heckflügel aus Carbon zu den Optimierungen für die Rennstrecke. Für die Sicherheit des Fahrers sorgen unter anderem ein Rennsitz mit Kopf-Protektoren, eine Rennsport-Sicherheitszelle sowie ein Sicherheitstank nach FIA-Reglement. Ein kraftvoller Reihen-Vierzylinder-Motor, ein sequenzielles Getriebe mit Schaltwippen am Lenkrad, ein konsequent entwickeltes Rennfahrwerk - der neue Golf wurde sorgfältig für den Einsatz auf der Rennstrecke vorbereitet. Volkswagen Motorsport hat das Auto gemeinsam mit der Sportabteilung von SEAT entwickelt und kann somit auf umfangreiche Erfahrungen mit dem SEAT Leon Cup Racer zurückgreifen. Wie bei den Serienfahrzeugen aus dem Volkswagen Konzern bietet die MQB-Plattform auch bei den Rennfahrzeugen zahlreiche Synergien und reduziert die Kosten für Aufbau und Einsatz des Tourenwagens. Der 2-Liter-Turbomotor mit Benzin-Direkteinspritzung ist aus dem sportlichen Topmodell Golf R bekannt, leistet in seiner Rennversion 243 kW (330 PS) und liefert 410 Nm Drehmoment. Volkswagen hat 20 Golf GTI TCR für die aktuelle Saison der im vergangenen Jahr ins Leben gerufene Einsteiger-Tourenwagenserie TCR gebaut. Die Kundensportwagen für diese Saison sind bereits alle an Teams vergeben. Die ADAC TCR Germany startet in ihrer Premierensaison voll durch. Bis Ende Januar haben sich bereits zwölf Teams aus Deutschland, Finnland, Italien und der Schweiz frühzeitig einen Startplatz in der neuen Tourenwagenserie gesichert und insgesamt 26 Fahrzeuge eingeschrieben. Im Feld der rund 330 PS starken Tourenwagen sind bisher die Rennversionen von Honda Civic, Seat Leon, Opel Astra und Volkswagen Golf vertreten. Bis zum Nennschluss am 29.02.2016 rechnet der ADAC mit weiteren Marken und Teilnehmern. Die ADAC TCR Germany startet vom 15. bis 17. April 2016 in der Motorsport Arena Oschersleben in ihre Debütsaison. Die Rennen der ADAC TCR Germany werden bei SPORT1 im Free-TV übertragen, alle Tourenwagen starten auf Reifen von Exklusivpartner Hankook. "Der sehr große Zuspruch an der ADAC TCR Germany hat unsere Erwartungen sicherlich mehr als erfüllt", freut sich ADAC Sportpräsident Hermann Tomczyk über das große Interesse an der neuen Serie. "Mit vollen Feldern im ADAC GT Masters und in der ADAC Formel 4 sowie dem großen Interesse von Teilnehmern an der ADAC TCR Germany dürfen wir uns schon jetzt auf einen außergewöhnlichen gemeinsamen Saisonstart aller drei Serien in gut zwei Monaten in der Motorsport Arena Oschersleben freuen." "Wir freuen uns nicht nur über die Vielzahl von Teilnehmern, sondern auch über hochkarätige Teams aus dem In- und Ausland", sagt Franz Engstler, der gemeinsam mit dem ADAC e.V. die ADAC TCR Germany ausrichtet. "Das Interesse der Teilnehmer und die Reaktionen von Fans und Medien zeigen, dass wir auf dem richtigen Weg sind. Die vielversprechende Debütsaison der ADAC TCR Germany spiegelt die Leistungsfähigkeit unserer Kooperation mit dem ADAC wieder, mit dem wir gemeinsam in kurzer Zeit wieder eine Plattform für professionellen Tourenwagensport in Deutschland aufgebaut haben." Die Tourenwagen der ADAC TCR Germany starten in der Debütsaison 2016 auf Reifen des neuen Exklusivpartners Hankook. Der Premium-Reifenhersteller und der ADAC vereinbarten die Partnerschaft für drei Jahre, die auch eine Visualisierung auf sämtlichen ADAC TCR Germany-Fahrzeugen und weitere Marketing-Maßnahmen umfasst. Die rund 330 PS starken Tourenwagen der ADAC TCR Germany starten auf Hankook Ventus Race Rennreifen. Ihr Renndebüt feiert die neue Serie vom 15. bis 17. April 2016 im Rahmen des ADAC GT Masters in der Motorsport Arena Oschersleben. Der ADAC schlägt 2016 ein neues Kapitel im deutschen Tourenwagensport auf. Die ADAC TCR Germany schließt im kommenden Jahr die Lücke zwischen Formelsport und Rallye und startet bei sieben Rennwochenenden in Deutschland, Österreich und den Niederlanden. Im Rahmen der Essen Motor Show (28. November bis 06. Dezember) präsentiert der ADAC auf seinem Stand (A180) in Halle 3 die neue Serie sowie Termine und Eckdaten der Debütsaison. Die Rennen der ADAC TCR Germany werden im kommenden Jahr bei SPORT1 live im Fernsehen und Online im Livestream zu sehen sein. Sechs Mal ist die ADAC TCR Germany 2016 im Rahmen des ADAC GT Masters am Start, inklusive der Auslandsgastspiele auf dem Red Bull Ring/Österreich und dem Circuit Park Zandvoort/Niederlande. Eine siebte Veranstaltung ist geplant. Fest steht bereits das Veranstaltungsformat. Nach zwei freien Trainings über 30 Minuten wird in einem zweigeteilten Qualifying über 20 und 10 Minuten Dauer die Startaufstellung für das erste von zwei Rennen je Wochenende ermittelt. Das Ergebnis des zweiten Qualifying ergibt dann in umgekehrter Reihenfolge die Startaufstellung für Lauf zwei. Die Renndistanz der jeweils zwei Läufe pro Wochenende beträgt jeweils 30 Minuten. Nennungen für die erste Saison der ADAC TCR Germany werden ab dem Beginn der Essen Motor Show entgegen genommen. Teams, die sich frühzeitig für eine Teilnahme entscheiden und sich bis 31. Januar 2016 einschreiben, profitieren von attraktiven Vorzugskonditionen. Insgesamt ist die ADAC TCR Germany 2016 mit einem Preisgeld von 150.000 Euro in Geld- und Sachpreisen dotiert. "Die Resonanz auf die neue ADAC TCR Germany war bisher sehr hoch. Die bisher durchweg positiven Reaktionen zeigen, dass wir mit dem Konzept richtig liegen", sagt ADAC Sportpräsident Hermann Tomczyk. "Das ADAC GT Masters bietet der ADAC TCR Germany eine optimale Plattform für eine gute Entwicklung." Auch Franz Engstler von Engstler Motorsport, der gemeinsam mit dem ADAC die neue Serie durchführt, freut sich über den bisher guten Zuspruch. "Wir haben einen interessanten Rennkalender mit sechs Veranstaltungen im Rahmen des ADAC GT Masters und arbeiten derzeit an einem attraktiven siebten Event. Die Nachfrage nach Startplätzen war bisher sehr hoch, wir rechnen mit einem starken Feld und großer Markenvielfalt." "Die ADAC TCR Germany geht im kommenden Jahr nicht nur mit einem attraktiven Kalender auf einer etablierten Veranstaltungsplattform, sondern auch mit einem tollem Fernsehpaket bei unserem TV-Partner SPORT1 ins Rennen. Damit geben wir der Serie die optimalen Voraussetzungen für einen erfolgreichen Start", so ADAC Motorsportchef Lars Soutschka.